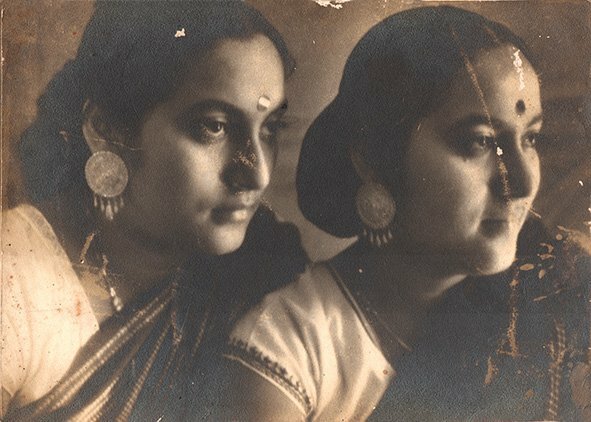 This is an photograph of my mother Manobina Roy (left) and her identical twin sister Debalina Mazumdar (right) (nee SenRoy) taken in the c.1940 in Calcutta (now Kolkata). It is most likely that the image was photographed by my father, the acclaimed film-maker, Bimal Roy. My mother and her twin sister were born in 1919, merely 15/20 minutes apart. However, Debalina, came first, a few minutes before midnight on November 26, and my mother a few minutes after, on November 27. Hence, while they were twins they had two dates of births. At home they were fondly called Lina di and Bina di. In mid 18th century, my maternal family, the Sen-Roys, migrated on boat up the Ganges, from Banda, Jessore district (now in Bangladesh) to the princely state of Benaras (now Varanasi). Our family is unsure why they moved to the north; perhaps the elders, like millions of others, wished to spend their last days at the pilgrimage in Benaras; nonetheless the region became their home for four generations. At the time, Benaras was under the rule of Kashi Naresh [King of Kashi (Ancient name of Beneras)] whose capital fort was situated in a beautiful city, right across the river, in Ramnagar. For generations, the royal family had been patrons of knowledge – later donating land for several educational institutions including the Benaras Hindu University. Fortunately for our family, in addition to ensuring good education for his six sons, my maternal great-grandfather also became the tutor to the king’s son, the young prince of Benaras, Yuvraj Prabhu Narayan Singh. By the time the prince became the next king, the kingdom was absorbed into the British Empire’s United Provinces of Agra and Oudh (U.P.A.O). My grandfather, Binod Behari Sen Roy, one of the six brothers, completed his Masters degree and began teaching at the Nanak Chand Trust (later Nanak Chand Anglo Sanskrit College) in Meerut. He was fluent in Persian, Sanskrit, Urdu, English & Bengali and was deeply interested in culture, arts and photography. He even became a member of the Royal Photographic Society of Britain. In 1913, on the behest of the king, my grandfather Binod was asked to tutor the King’s son, Yuvraj Aditya Narayan Singh, and help start Meston High School, (named after U.P.A.O’s Lieutenant-Governor, Sir James Meston), in Ramnagar. The school, now a college, has been renamed Prabhu Narayan Government Inter College, and is one of the oldest colleges of Northern India. My grandfather served as the head master of the school- he was paid a good salary and was given a large home surrounded with nature – with hundreds of trees, plants, flowering gardens, and domestic animals. After their marriage, my grandparents had three daughters, Anusuya, the eldest, and then in 1919, Debalina and Manobina the identical twins. My grandfather was a progressive man and wished for his daughters to be well educated, however Anusuya got married at the age 13, to a science student training under C.V Raman, so my grandfather focused his attention on the twins. He would take them to attend durbars, cultural programs, encouraged them to be curious and engage with nature, music, as well as academics. Once he even once took them to see a Mujra (courtesan performance) and I am told my grandmother was seriously upset. The king’s children also became friends and every Ramlila (Ramnagar’s original and most famous event of the year) the girls were sent the royal elephant for a ride. On another occasion the king gifted them a tiger cub, that eventually had to be returned. The life they led as children, my mother would tell us, was indeed nothing short of a fairy tale. It was a very happy childhood. On their 12th birthday, my grandfather gifted the twins a Brownie (camera) each, on the condition that they learn to process film and make prints – and built them a makeshift dark room. So began a fascinating life-long zeal with photography that both sisters engaged with for the rest of their lives. They photographed nature, landscapes, people and even each other. As young adults, they became members of the United Provinces Postal Portfolio Circle, a group created by the Photographic Society of India where members would exchange photographic prints through post that would get exhibited in a salon in another city. In 1936, after my mother (Ma), Manobina, got married to my father, Bimal Roy, and they moved to Calcutta. She was 17 and he was 27. My father at the time was working as a photographer, soon as a cinematographer and eventually as history notes, went on to become one of the most well-known film makers of the subcontinent. My aunt, Debalina pursued a Master’s degree in Calcutta and like my mother, she too continued to practice photography. Seven years later, she too got married and had children. The first photographs under both sisters’ names were published in a 1937 journal, Shochitro Bharat. In 1940, of the 81 photographs displayed at the Allahabad Salon (now Prayagraj), Debalina and Manobina’s photographs were of most interest. They sent competition entries and won prizes. While they engaged with photography, many a times in each other’s company, they knew that even photographing the same subject would have different results with two different point of views. Through the course of the sisters’ lives, photography was not a professional engagement, yet it was a serious discourse. While my father was out working on films, my mother held the domestic fort, had four children, ensured we were all well cared for, and continued photographing, but mostly within the extended family – documenting our childhood, travels, events and family members. Known as the ‘lucky’ photographer, a matrimonial photograph of a girl taken by her would supposedly and immediately get marriage offers. She loved photographing people more than anything else. Nonetheless there were some opportunities that I am sure cheered her privately. While my father, I personally feel, did not encourage my mother’s craft enough, but acknowledging their serious interest, would now and then offer both the sisters information and material to read on camera, lenses, and film rolls. Debalina’s husband on the other hand was not that interested in photography, but she too found herself often composing pictures with enthusiastic members of her family-in-law. In 1951, a series in the The Illustrated Weekly of India “Twenty-five Portraits of Rabindranath Tagore” included a portrait of him photographed by Ma at Jagannath Puri. The same year our family moved to Bombay and Ma would photograph portraits and lives of friends, family, streets of international cities, our own country’s rural and tribal lives. She even photographed portraits of Jawaharlal Nehru, Vijay Lakshmi Pandit and V. K. Krishna Menon among others. Nehru, I am told, considered it to be one of his favourite portraits. In 1959, Ma found an opportunity to publish her work again with The Illustrated Weekly of India when she traveled to Moscow with my father, who was on a film jury for the 1st Moscow International Film Festival. She was asked to take photographs and write about her visit. After that she began writing a column for Femina on her musings about the world. She wrote well and would write often, if not for someone else, then for herself, or for us. Now when I think back everything my mother ever told us was always a wonderful story told with great relish. Her beautiful stories about her life or others, her sensitive approach to life still resonates with us. Debalina too received opportunities to publish her work in some journals including the The Illustrated Weekly of India. Many a times, the sisters would meet in different cities, and with children in tow, photographed street after street with great gusto. In London, they even photographed the suffragettes. 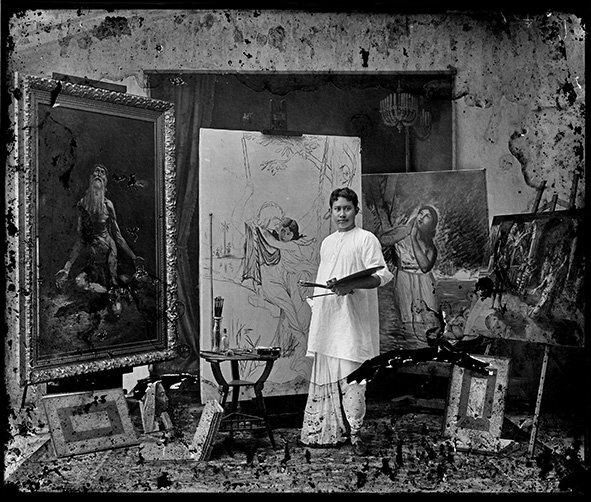 Debalina eventually went on to serve the Photography Association of Bengal as Chairperson for three years. 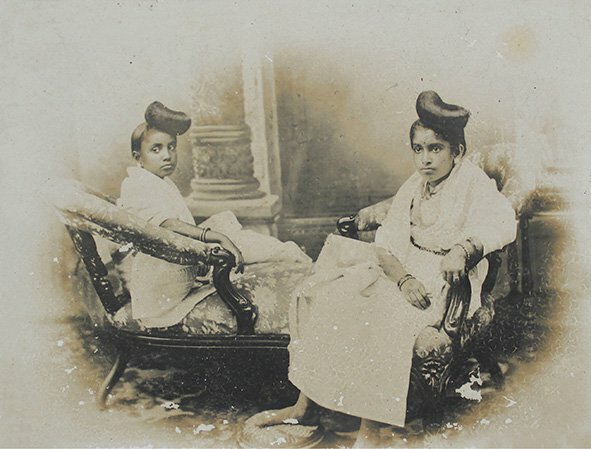 The twin sisters are considered to be two of the earliest and pioneering women photographers of the Indian Subcontinent, even if neither of them became professionals. In interviews, they both individually mused that they had led very happy and exciting lives, yet in another time they could been professional photojournalists. My mother, Manobina, continued photographing well into her late 70s until her health began to give way and she passed away in 2001 after a prolonged illness at the age of 82. At home in Mumbai, she spent the last few weeks with her sister with whom she had shared considerable time, in the womb, in life and in creative expression. Ma has left us a legacy in form of an incredible body of photographic works, as well as written literature. My aunt Debalina, who passed away ten years later in 2012 at 92, has also left behind her own legacy, an amazing body of work that now lies as an estate with the Centre for Studies in Social Sciences, Kolkata. 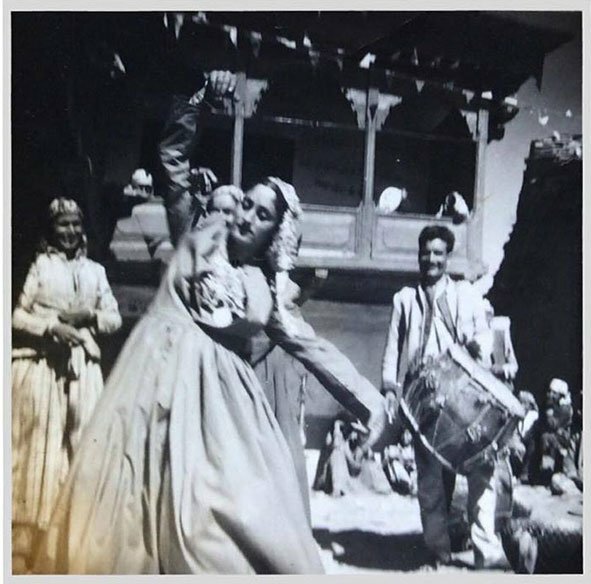 My grandmother says she was dancing the Pahadi Nati, a folk Pahari Dance. The traditional dress of Kullu is Reesta, an attire that was inspired by the British gown, a combination of a long kameez (shirt) tucked inside a long heavily pleated skirt accompanied with a Sluka (Jacket). Alternately, it is also made in a tunic form with woolen fabric to be worn over in winters, which my grandmother wears in this picture. Ancestrally, my family were Zamindars (land owners) and like many land owners of the time cultivated Opium up until the early 20th century for the British until its prohibition and drop in trade. Opium consumption in the subcontinent was common and was (in some places still is) also fed in small quantities to babies, mixed in milk, and while they slept their mothers do the house chores and work in the farms. After Opium was dropped, landowners began cultivating other crops and ours grew Basmati Rice and formed Apples and Cherry Orchards. My grandmother Damyanti Goswami Pandit (later Thakur) was born in 1947. She was the second child to a family of two sisters and three brothers. However as unspoken tradition was within several families in the subcontinent, she was offered for adoption to relatives within the family who had no children of their own. My grandmother was deeply loved and pampered, so much so that she did no house chores. As an adult and after her adopted parents passed, regional hereditary laws favoured my grandmother, because unlike much of the subcontinent at the time, daughters in our custom could inherit property and assets of their parents. Right after high school, my grandmother got married at the age of 16. I wonder about the generational irony though – she had enough sources to have gone abroad and continue her education, yet she chose a life of a wife and delivered her first child at a young age, my dad, at the age of 17. She was still a young girl herself, and there were stories of how she would be off to play with her friends while her mother took care of her grandchild, her daughter’s first born. In a following years my grandparents had four children, two sons and two daughters. My grandfather came from a Rajput family in the same village. He was educated and the only one in the entire village to have graduated and work with government services. Interestingly unlike most women, my grandmother didn’t adapt to traditional roles of motherhood, and their four children were mostly taken care of by my grandfather while he was posted in Simla, because good education was only available in bigger towns. My grandmother, on the other hand, chose to live in the village and actively take care of her lands and farming businesses with frequent visits to Simla. The children grew up to be in the Armed Forces, Farming land and in Government services. This photograph literally symbolizes my grandmother. I remember her dressing up like a bride whenever she got a chance and dance. My father inherited the same love for dressing well and would spend his entire pocket money on having the latest fashion copied for himself. Needless to say, their love and quest for dressing up well has been passed on to me. Both my grandparents now stay on and off between Simla and the farm land. My grandmother is now 71, she is still immensely loved and adored by everyone in the village. She continues to actively looks after her lands and she still loves to dress up and dance like she is 16. 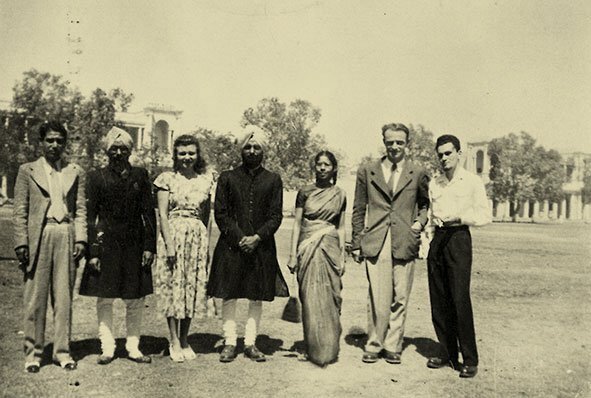 This is photograph is of my grandfather S. Gurdial Singh (standing right) and his fraternal twin brother S Harminder Singh (standing second from left) with people from the Embassy of France in New Delhi in 1949. The brothers Gurdial and Harminder were born on August 1, 1916 in Wazirabad (now in Pakistan). The family was from a small town in Punjab, Chamkaur Sahib, where Guru Gobind Singh, the tenth Sikh guru’s, sons were sacrificed. The twins’ architect father Bir Singh had helped build government and residential buildings in Lahore (now in Pakistan) and Chamkaur town. Bir Singh, my great grandfather had two wives, and the first wife had a daughter. The societal pressure for property distribution (the patriarchal line) was immense by his brothers, so he married Balwant Kaur, who gave birth to the twins with the blessing and prediction of a local saint in Punjab, Randhir Singh. The twins it turned out were quite unlike each other. Gurdial Singh was a introvert, and liberal hearted with a tight circle of friends. Harminder Singh was an extrovert, dynamic, social, philosopher who loved meeting the whos who. The twins were just eight years old when their 34 year old father Bir Singh passed away and they were brought up by their mother, Balwant Kaur. Their spirit made them known for their strength, as Harminder (known as Kirpal Singh then) would daringly go swimming in the Ropar canal (the beginning of Sirhind Canal) and loved playing the banjo. They studied at BASJS Khalsa Sr. Sec .School, Chamkaur Sahib, and then went to do their higher studies at Wazirabad. Gurdial Singh then developed a serious interest in the French language and began learning the language in Pakistan, he then went to Pondicherry, (former French colonial city in South India), for an year, in 1936, to refine his knowledge. It was in 1940, Gurdial Singh, who by now was an expert on the language, became a professor of French at S.D. College (Sanatana Dharma) in Lahore. Gurdial Singh married Harjit Kaur in Wazirabad and had two sons and a daughter; Harminder Singh married Kanwal Singh had two daughters and a son. Both marriages were arranged by Sant Randhir Singh, who had predicted their birth. After partition in 1947, the brothers moved to Delhi, and rebuilt their lives from scratch. My grandfather Gurdial worked in Delhi’s Dyal Singh College and went on to become the Vice Principal. He wrote many Grammar books and poetry in French. The big milestone was when he translated the Japji Sahib, the Sikh morning prayer into French. The then prime minister Indira Gandhi unveiled his book. He also translated Bhai Vir Singh‘s poems and Guru Tegh Bahadur‘s hymns into French. Some of his original French poems were broadcast by AIR (All India Radio). One of his other big works written in French and English was the biography of Maharajah Duleep Singh (youngest son of Maharajah Ranjit Singh) who spent the last days of his life in France. It was in 1966, Prof. Gurdial Singh also participated in a special programme on French Television network in connection with the 300th celebrations of Guru Gobind Singh. He was the founder member of Alliance Francaise, Delhi and member of the Board of Studies in French at the Panjab University, Chandigarh and at the Punjabi University, Patiala. My grandfather Gurdial came to be known as the literary genius and his friends who would sit with him to hear him tell stories and narrate poems for hours. There were times, I would see him in his study, writing for days. Eventually he translated, for the first time, the entire Guru Granth Sahib into French. There were shabads (hymns) he would write and sing in French. The songs I grew up listening were mostly in my grandfather’s voice in French recorded on a tape recorder by his daughter, Gurdeep Kaur. His twin my granduncle, Harmandir Singh was in the Indian Foreign Service and served in Cairo, Nairobi, Kinshasa, and finally moved to High Commission of London in 1969. He was given the third Shiromani Award in 1979 for promoting peace and harmony in a multi cultural society. He was part of more than 20 organisations, globally, that worked towards Sikh charity and community work. He was the executive member of World Congress of Faiths and attended the annual conference at Canterbury in July 1976. The brothers indeed became the cultural ambassadors of their culture around the globe and their literary genius resulted in a creative life well-lived. Gurdial Singh passed away in 1990 and Harminder Singh passed away in 2010. After Partition, they had built a life from scratch with resilience despite losing their home, in what became Pakistan. They found global fame with their literary genius and their never-say-die Sikh spirit opened up their lives that were full of curiosity and zest to understanding, discovering and sharing new and beautiful views of the world. This narrative has been rewritten and reformatted for the purpose of this archive. During the early 1980s I was posted in a western European station as a diplomatic officer with an added responsibility of covert security intelligence. Under diplomatic cover I had the usual consular duties but my real work was gathering information in a clandestine manner. One day my boss, the chief at RAW (Research & Analysis Wing/ Indian Intelligence) NF Suntook briefed me about an unusual assignment that was requested directly by the Prime Minister of India, Indira Gandhi. I was to ensure the well-being of a former anti-colonial activist, journalist and a personal friend to Nehru, ACN Nambiar who was based in Zurich. He was 84 and I was 43. I didn’t really know much about Nambiar, and an assignment with no intelligence agenda provided relief from my regular stressful duties. I met with Nambiar in his modest flat in Spiegel Gasse, two buildings away from Vladimir Lenin’s old residence. He was quiet, humble and a bit of a recluse and I struck a strong friendship with Nambiar. He was a treasure trove of information on European history, governance, security and power play of nations from the 1920s to the 1980s, and mentioned that he knew Subhas Chandra Bose well. Years after he passed away in 1986, in 2001, I happened to read a book by Rudolf Hartog that mentioned a rarely known “Indian Legion”, a small Indian Army in Nazi Germany raised by Subhas Chandra Bose. The Legion comprised of Indian POWs (Prisoners of War) captured by Nazis during their North African Campaign. I was surprised to know that Mr. Nambiar was the main person administering this 4,000-strong army. He had never mentioned anything about that in our meetings and conversations over six years. To challenge all contrarian views, Nambiar was not only a close friend to the Nehru family but he was also the right hand man of Subash Chandra Bose (Netaji) in Berlin. This discovery set me off on a years-long research to find out who Nambiar really was. To understand what his contributions to the subcontinent were, brief but imperative points of world history in this narrative are important. Born in 1896 in Thalassery, Malabar in an intellectual and wealthy family, Arathil Kandath Narayanan Nambiar or ACN Nambiar was the son to the well known Malayalam litterateur Vengayil Kunhiraman Nayanar. Surrounded with the educated and the elite of the subcontinent, in 1919, he fell and love with, and against the wishes of his brother, married Suhasini Chattopadhyay, sister of freedom fighters Virendranath Chattopadhyay (known as Chatto) and Sarojini Naidu. After the World War I, Berlin had become a center for nationalists associated with India’s freedom movement. Assuming that Germany’s bitter relations with Britain will offer cover, money and political support for their agendas, Indians ranging from students to revolutionaries began to frequent/live in Berlin. Inspired by the Ghadar Party, and support of German authorities, Chatto along with other freedom fighters had helped form the Indian Independence Committee (Berlin Committee), and Nambiar was right in the middle of it, a witness to all of world’s modern history at once, at one of its most interesting times. After their marriage, Suhasini attended Oxford, and Nambiar and she later moved to Berlin around 1924, for Nambiar had been asked to administer the Information Bureau of the Indian National Congress – The Indian News Service & Information Bureau co-set up by Chatto, on Nehru’s instructions. Nambiar had also began writing as a correspondent for European and Indian Publications about several issues including unequal treatment of Indians by Europeans. After an extra marital romantic affair, Nambiar’s marriage however did not last –and the couple separated. With funding from Nehru in tight supply, and eventual ideological differences between Chatto, Gandhi and Nehru, the Indian News service also lost its influence. Circumstances placed Nambiar in a fascinating position to interact with various leaders, activists, conspirators, and revolutionaries from all over the world. British intelligence reports that though acquainted through a number of people including his brother, Nambiar met Nehru in person for the first time in Brussels in 1927, at the anti-imperialist congress and they became very good friends. Nambiar was also meeting with correspondents from different parts of the world that helped him form a excellent network with vast number of political organisations and ideologies. Nambiar on the invitation of USSR also visited Moscow in 1929, but that may have also been to meet Suhasini who was imbibing the values of a chosen political path, Communism. Suhasini became the first woman communist member in the subcontinent. When she returned to India, the British Special Branch in Bombay began intercepting private correspondence between Nambiar and Suhasini. In 1933, when the Germany came under the Nazi regime, Nambiar and Chatto took an anti-Nazi stand, and were arrested for an alleged involvement in the burning of the Reichstag building in Berlin. Hitler’s people (SA) caught him and kept him under arrest for four weeks in Berlin. He was then expelled from Germany and he fled to Prague, Czechoslovakia (now Czech Republic and Slovakia) and from there in hiding to France. In 1934, when a tall German approached him in a café, he says he thought- “This is the end”, but it turned out to be a representative of Netaji Bose who wanted to meet him. Bose was aware of Nambiar’s network and though both differed on the relations with Nazis, a friendship blossomed. Nambiar agreed albeit reluctantly to help Bose, aware that they shared the same goal – an Independent India. When Bose was incarcerated in India from 1940, he escaped and resurfaced in Berlin in 1941. He finally got an appointment to meet with Hitler in 1943, and after tracking down Nambiar again in France, much to the chagrin of the Nazis, insisted that he came along as an interpreter. Bose wanted Hitler’s support in defeating the British in India, and insisted on the Indian POWs they had captured during the North African operations against UK & Commmonwealth troops. In winter of 1941, Nambiar became Bose’s deputy and they both jointly established Free India Centre, a division under the Azad Hind movement, working to rally support or India’s independence, use psychological propaganda warfare via radio & print material, and train the POW army known as Indian Legion – IR 950, into an assault group that would form a pathfinder to a German–Indian joint invasion of India via Afghanistan. In 1943, Bose left for the far east to puncture Britain from the East with his already established Indian National Army (INA), leaving Nambiar to handle all his European operations. Despite Nambiar’s efforts, not much of the Indian Legion was put to use eventually. After independence, Nambiar was assigned diplomatic assignments in Europe by Jawaharlal Nehru, including an ambassadorship to Scandanavia, and in 1951 as the first Indian Ambassador to the Federal Republic of Germany and helped forge European alliances for the Indian Governmnent. With German ex-officers of the Indian Legion he even founded an Indo-German Society in 1950. But he didn’t quite enjoy the diplomatic profile and became a European correspondent of the ‘Hindustan Times’ though some suggest his last post was a cover for industrial intelligence collection. He was awarded the Padma Bhushan in 1958. Contrary to what Indians think, the Nehru and Bose rivalry was a creation by later political groups. Yes, they had different opinions, but they deeply respected each other and looked out for the others’ well being. Bose ensured Kamala Nehru was well cared for during her medical treatment in Switzerland, while Nehru was in prison. After Bose went missing in 1945, Nehru insisted on financial compensation to his family in Germany, that was facilitated by Nambiar. Nambiar’s account of Nehru and Bose does not reveal any personal grudges or tensions between the two. Yes, Nehru held certain assumptions of Bose, but didn’t doubt his patriotism. Bose too recognised Nehru’s influence in India although he did not agree with Nehru’s pro-British attitude. This is a reminder for current generations that we can maintain good relationships despite differences. Over time Nambiar became a guardian and god-fatherly figure to Indira Gandhi —a friend and a confidante, politically and personally. He even advised her on the selection of officers for India’s Intelligence & the RAW head. In 1984, with concerns for his health, Indira Gandhi insisted that he return to Delhi, and he reluctantly agreed, however a few weeks after he returned, she was assassinated causing him severe trauma, and depression. Nambiar and I had come to form a wonderful warm friendship, and he considered me to be almost like his own son. To help him, I suggested he write his memoirs, instead he agreed to dictate his memoirs to a tape recorder. In January of 1986, the man who knew too much, and whom no one knew too much about, passed away at his residence in New Delhi. with expert inputs from Prof. Projit Mukharji – USA. 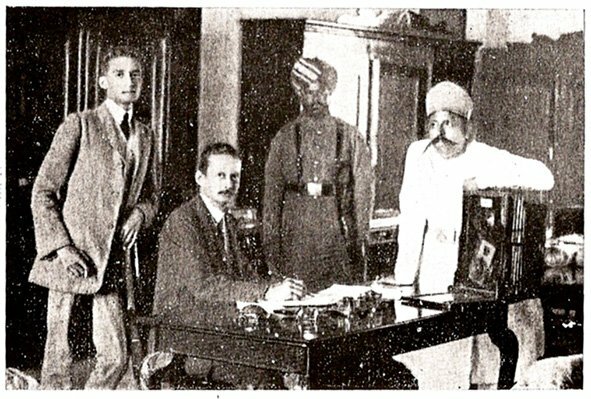 This is a photograph of our great grandfather Charles Richard Hardless, his son Charles Edward and the Nizam of Hyderabad’s court staff, taken in Hyderabad State (now Andhra Pradesh) in 1912. Our great grandfather was at the time a detective superintendent and the government’s first handwriting expert. He had been engaged by the Nizam Mir Osam Ali to help foil a conspiracy to overthrow his reign, and is seen here examining some documents. My great grandfather was what Prof. Projit Mukharji and other experts deem ‘The founder of a dynasty of graphologists’. Our great-grandfather, Charles Richard Hardless was born in 1866 in Calcutta (now Kolkata, West Bengal). We believe that his father worked with the East India Company and as was customary in most British families in India, Charles along with his other siblings were brought up between Calcutta and UK. Charles had a keen eye for detection detail and inspired by an uncle, John H. Hardless, an administrator in the British Indian Railways and a trained graphologist (Hand-writing expert) – Charles taught himself the same skill but with a lot more ingenuity. By the 1870s, the Calcutta police had established an exceptionally skilled and large Detective Unit (especially after the infamous Amherst Street murder and Ezra Street murder cases). The department was constantly on the look out for expertise that could help them solve criminal cases in the subcontinent – a empirical region that was still culturally unfamiliar and whose diverse acumen, even on crime, they were constantly trying to catch up with. In London, Charles Richard left school early, and after a brief stint at the accountant-general’s office in Bengal he joined the Posts & Telegraph Department in Calcutta in 1904 as a handwriting expert on railway and postal frauds, quickly rising to a permanent post. Interestingly, his appointment happened to coincide with a notorious case of mistaken identity/wrongful conviction in England, that relied on handwriting expertise. Based on that, in 1908 the British Indian government persuaded London officials to appoint my great grandfather as the first ‘Government Handwriting Expert’ with the Calcutta Police. In 1909, he served high profile cases as a graphology expert such as the Alipore Bombing case and later for the defense, on the infamous identity theft / Impostor case in Dhaka – The Bhawal Sanyasi case. Trained in about 16 languages including Mandarin (China), Bengali and Hindi, the great grandfather travelled widely, helping with cases and representing court expertise, from Rangoon to Peshawar and from Colombo to Bombay. With rising repute, within a few years he resigned from the government to establish his own investigation practice with his sons, and began receiving high profile commissions from several Princely estates including the Nizam of Hyderabad. My grandfather had an equally interesting personal life albeit it would have caused him a lot of turmoil. He married four times. His first wife Lilian Isabella died at the age of 29 of Cholera in 1899. The second wife, Mary Keogh, probably died of Septicemia in 1901 at the age of 27 after child birth. The third wife, Louise Maud Philbrick (my great grandmother) died in 1924 and the last wife, Phyllis, died in 1942. Clearly, he raised a very large family including Anglo-Indian descendants, many of whom are still scattered in India. Though they lived in Calcutta, at 17 Park Lane, Charles Richard gained many favours by the monarchs he served, for instance in 1917 he came into possession of an estate, The Sanctuary, in Chunar (now UP) most likely gifted by the Nizam. The bunglow on the estate was based on Italian Mansion blueprints sent to him by the Nizam. In Chunar, my great grandmother Louise established an extensive library. Some of the family was actively involved in the investigation and detective practice even while its patriarch Charles Richard was alive. And after his death in 1944, my great grandfather’s three sons continued his legacy. The oldest, Charles Edward (in photo), fine tuned and upgraded their graphology techniques. Philip William Ravenshaw ventured into forensic chemistry and the youngest, my grandfather, Harold Richard Gordon developed techniques on Ballistics. They expanded their services to other parts of subcontinent and even established their own publishing and press Hardless & Hardless that published several books on criminology, and a quarterly journal. We still possess the first edition book entitled ‘Forgery in India, A Practical Treatise on the Detection of Forgery dealing with the languages of India’ (1920), a book that is still taught in Indian Law schools. In 1938 they even set up the School of Document Investigation, at 19 – Hastings Road, Allahabad. Many of my great grandfather’s descendants left India in the late 40s/early 50s including my own father Harold Richard (I am aware that there other descendants in India still around, albeit still unknown to us). 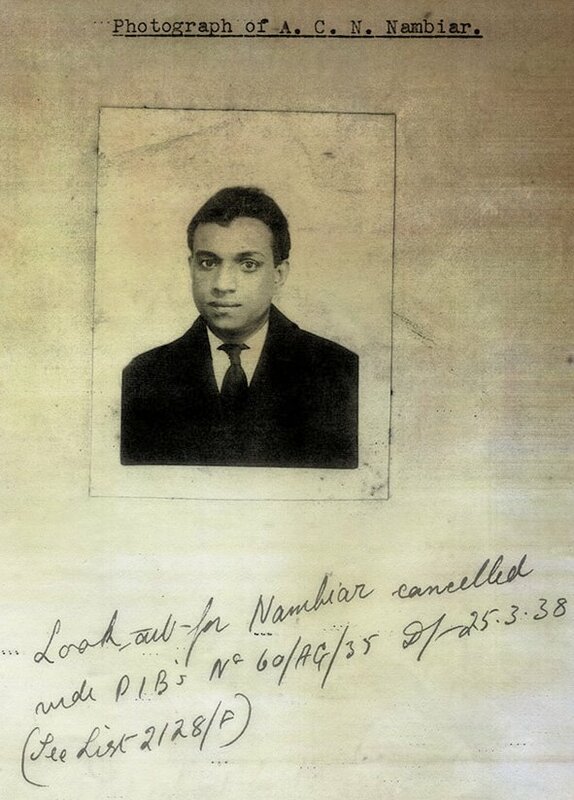 My grandfather – Harold (senior) stayed on in India and continued to practice criminology until his death in the 1970s. His sister / my aunt Marie Louise Hardless assisted him when he worked from Chunar. Unfortunately, she was murdered at the age of about 53 in the 1990s, apparently by burglars. My maternal great grandfather, Mr. Bhaskar Gangadhar Athalye owned a dairy farm in Borivali, Bombay (now Mumbai), and lived in a rented home in Shivaji Park with his wife and eight children. The dairy farm came to an abrupt halt when his entire cattle died due to a disease. (This information is unverified but he supposedly helped draft the plan for the now well known Aarey Milk Co-operative). Around 1940, with communal tensions abound, the family travelled to Baroda, Gujarat to attend a wedding and since Baroda was relatively safe from the communal turmoil and violence, he decided to extend the stay and keep his family there and look for some work. But a job interview in Delhi didn’t go as planned because of a conflict in political beliefs. In my quest to research my great grandfather, I discovered several things incredible things about him, that I never known before. He travelled the country promoting a new spiritual movement of inter-religious co-operation known as ‘UNISM’. Unism is a philosophy which emphasizes unity among all things and human beings, a concept found in every religion. However, Unism is patently anti-religious (not anti-religion). A follower of Unism may follow tenets of religions, but the central tenet is that Unists have absolutely no emotional ties, exclusive adherence and preference to any specific religion. For a while, it seems he even lived in Kashmir and that he wrote a small book that I found in the Jammu Archives & Library, ‘The Kashmir Cauldron’. The book, it turns out is beholden by many as ‘one the most revered works on Kashmir’. It offers a detailed analysis of the political situation in Kashmir at the time and also sheds light on the correspondence and ties my great grandfather shared with various politicians and scholars, including Jawaharlal Nehru. I found a scanned copy for myself from the University of Wisconsin, USA and the book, if I may say so, is quite well written, and unbiased towards any religion and an overall well rounded academic analysis. How he supported himself monetarily, I am not sure. But he had come to be quite renowned and I assume that people must have helped him with his expenses. For instance, when people from all backgrounds and classes began visiting him, at his lone hilltop shelter in Kalkaji (in Delhi) and many people including politicians volunteered to add little bits and pieces to the shelter that eventually and somehow became a Lord Shiva temple. The temple still exists and has a shrine in his honour, buried under dust and dry leaves. For years, my mother would often mention some black & white photographs of her grandfather with monks and nuns from around the world that I hunted for but never found. I assumed that photographs were probably lost. However, I cannot explain the co-incidence of discovering them with an extended family member who found them right after I formally began researching my great grandfather. Several of the photographs are of his travels in South East Asia. But I know for a fact that he travelled to various parts of Europe, USA, and South America too. The Singapore Free Press newspaper of 1961 I have a clipping of, writes of his visit to their country, his faith and beliefs about Unism, and his upcoming plans to meet other spiritual leaders around the world including the Pope. The article also mentions that he founded a ‘World Fraternity of Monks’ and that he presided over a ‘USSR Cultural Festival’ in 1956. My great grandfather’s comment in the article above states, “ If I were to seek a career I would have been a soldier. In the real sense I wear a ‘Khaki uniform, I love discipline and I love service of mankind to the point of laying down life for a cause”. Known as Swami Bhaskarananda Paramhansa, my great grandfather passed away in 1975 due to old age. This story of my great grandfather sounds all too extraordinary, but I have attempted to verify every aspect of it. For the last two years I have been researching him for a documentary film, and I hope that someone may recognise this radio interviewer at a radio station (it could be anywhere around the world) and if there is anyone who might know more about my great grandfather. I would be happy to learn about it all. 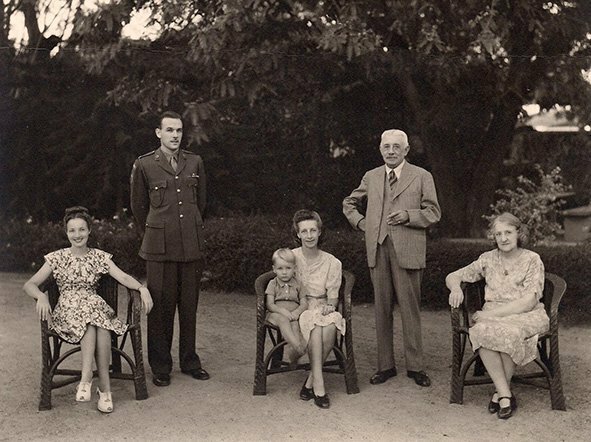 This is a photography of my great grandfather Gustav Hermann Krumbiegel with his family, also known as GHK, taken at their residence, Granite Castle, in Bangalore. My great grandfather Gustav Hermann Krumbiegel or GHK as we call him, was born on December 18, 1865 in Lohmen, Germany. He studied horticulture and garden design at Pilnitz, Germany and after graduating, wrote several letters for an opportunity to work with The Royal Parks in London, until finally, he was offered a job to design the flower beds for Hyde Park, the largest Royal Park in London, UK. After his contract at Hyde Park ended, he became an employee and a lecturer at the Royal Botanical Gardens in Kew (London district) and in his spare time studied Architecture design at Kensington University. The beautiful gardens of London were a usual visit for most of the Indian Subcontinent’s Royalty and thus an impressed Maharaja of Baroda, Sayajirao Gaekwad III, asked for a horticulturist for his gardens. When GHK was presented with the offer to be his horticulturist for the Baroda State, and considering a radically different climate of the Tropics, I have no doubt that my great grandfather would have thought of it as the most interesting opportunity, and accepted the offer. GHK moved to India in 1893, at the age of 26 was soon joined by his wife, my English great grandmother Katie Clara who arrived at the shores of Bombay at the age of 18. My Grandmother Hilda, Great Aunts Frieda and Vera were all born in Baroda (now in Gujarat). Over the course of time, GHK was hired by several Princely states across the subcontinent all of whom who had begun to compete with each other over gardens and talent. He designed his way across northern India with over 50 gardens, tea and coffee plantation estates of Ooty, several palaces and towns in Kerala and down south to the rocky terrain of Bangalore (now Bengaluru) when he was introduced to Maharaja Krishnaraja Wadiyar IV, the King of Mysore. In 1908, GHK was offered the job as the superintendent to redesign the Lalbagh layout and was gifted a home, a bunglow known as Granite Castle. The family embraced Bangalore with their hearts and decided to make it their home. During World War II, when the Dewan of Mysore, Mirza Ismail, appointed GHK as an architectural consultant to Mysore, Jaipur & Hyderabad, the British Residents in Mysore staged a huge protest. All Germans in India were declared enemies. Moreover, his letters show that he was quite vocal about his support for India’s independence. My English grandmother too, was labeled a traitor, because she had married a German. Twice it happened that the British Army imprisoned GHK in prisoner-of-war camps to be deported back to Germany. My great grandmother and her daughters were placed under house arrest, but both times the Maharajah of Mysore who had come to become a good friend, came to their rescue. The Maharajah later commissioned a painting and a bust of GHK, which currently resides at the Royal Palace of Mysore. Other visiting kings would gift GHK Tiger cubs and Elephants calves, until my great grandmother banned them from the house, as they would chew and ruin the furniture. A royal gift, a Gandaberunda bracelet, to my grandmother Hilda on her 18th birthday in 1915, is one that I wear often. As a superintendent for Lalbaug, GHK got to work creating the best Botanical Garden of the country, and began obtaining seeds from other countries and in return introduced the west to collections of bamboo, varieties of rice, and mango from India. He planted hundreds of new ornamental plants and flowering trees in Bangalore that would be covered in bloom through the year, including over 50% of the nearly 9,000 trees from 800 genera in Lalbagh. GHK designed the ornamental structures in Lalbagh such as balustrades, arches, staircases, bridges, pedestals, vases and fountains and with the honour of picking the site for Vidhana Soudha (State Legislature), he began influencing several urban planning decisions within the city. He introduced Art deco architectural styles and used local materials that have significantly formed the urban aesthetic of Bangalore. Within a few years, GHK had Bangalore earn the title ‘Garden City of India’ and ‘Green City’. However, had he seen Bangalore today, I know he would have been severely disappointed with its upkeep. My grandmother Hilda recollects that the great grandmother Klara was a master baker and all the staff at the botanical gardens would have cake with their lunch. On Sundays, both GHK and Klara would cycle around Lalbagh giving out plants to people and school children for free. He even began teaching prisoners to grow crops as he believed it would give offer them a renewed purpose. GHK envisioned a grand and healthy future in India through horticulture and inspired several other states in the Indian subcontinent to create a history of horticultural legacy. After he retired from his post in 1932, GHK continued to live in Bangalore, working as consulting architect and advisor in town planning and horticulture. His very last assignment at the age of 90, was for the Indian Government to landscape the Raj Ghat Memorial Gardens in memory of Mahatma Gandhi. My great grandfather Gustav Hermann Krumbiegel passed away in February of 1956 and was buried at the Methodist cemetery on Hosur Road, Bangalore. His epitaph reads, “Whatever he touched, he adorned”, and even though I never met my great grandfather, whenever my feet touch the Indian soil, I know, I’m home. The road adjoining the Lalbagh Botanical Garden is named after him as Krumbiegel Road. The newly born baby in this picture is my father, Jitendra Singh, and the lady holding him is my grandmother, Hansa Kumari This picture was photographed at Saint Francis Nursing home, Ajmer (Rajasthan) in October 1956 – a few days after my father , was born. The lady sitting on the left is Dr. Albuquerque, one of the most proficient gynecologists of that time. The nun sitting on the right is Sister Beatrice – a senior administrator at Saint Francis. The three nuns standing behind them also worked at the nursing home, and even though my grandmother doesn’t recall their names now, she can never forget their kindness and compassion as long as she lives. My family used to live in a small village Meja, about 125 kms from Ajmer (now a large township in Rajasthan). Our district at the time did not have very reliable medical facilities and so it was decided that my heavily pregnant grandmother would be taken to Ajmer for delivery. As soon as her ninth month began, my grandmother went to Ajmer along with my great grandmother by train. My grandfather went to drop them but returned immediately because someone had to stay back in the village to look after my bedridden great grandfather. The plan was to find a reasonably priced hotel or a rented apartment for the delivery period, but when the nuns learnt that my family were outstation patients and that only two ladies were going to stay back in the city, they figured it was going to be an inconvenient, especially in case of a medical emergency. So they made a generous gesture and offered my family a room in the hospital itself, in return for a nominal donation. The offer was indeed a blessing because 60 years ago, even well-educated women like my grandmother (who had completed her schooling from a convent – St. Patricks School, Jodhpur) weren’t very confident about living on their own and that too in an unknown town. The nursing home premises was a safe dwelling place and most importantly, my grandmother would have medical assistance 24X7. My grandmother and great grandmother lived at Saint Francis for nearly two months – the entire ninth month and a month after the delivery – and my grandmother has the most wonderful things to say about that time. 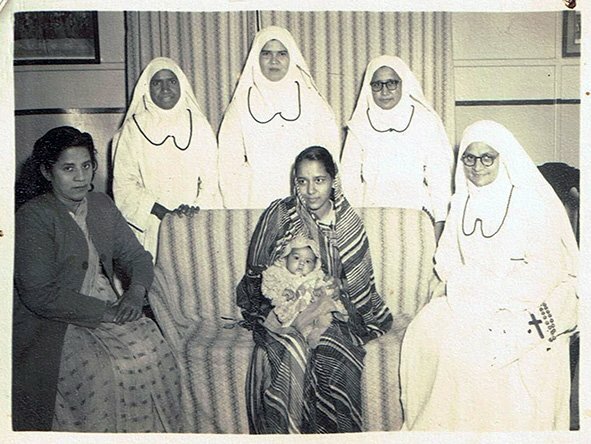 She recalls how the nuns showered her with much love and affection, and made her feel so much at home that she never realized the absence of her family. They knitted woolens for her soon to be born baby, made chicken broth (my pure-vegetarian great grandmother was not comfortable touching meat), they accompanied her for evening walks and shared many warm moments. Even after my father was born and things got more hectic, the nuns went way beyond their professional duties to lend a helping hand. Whether it was early morning or middle of the night, they were always there to offer their unconditional love and care. Soon the baby was about a month old and it was time to leave. But the bonds made over these two months lasted a lifetime, and every time that my family was passing Ajmer, they made it a point to meet the nuns. In fact, my family was so grateful for the kindness of these nuns that for several years after, during harvest season, my grandfather gifted sacks of grain to the nursing home kitchen as a token of appreciation. The nuns were reluctant to accept it at first, but when my grandfather insisted that it would help other outstation families like us, they accepted it graciously. With time, our association with Saint Francis got stronger – four of my father’s first cousins (my grandfather’s sisters’ kids) were born there, and years later, me and my brother as well. When I had a baby, he was born in another city at a state-of-the-art private hospital. A four day fixed package was offered to me with highly professional staff & efficient service. I was home on the fifth day and I have no complaints, but sometimes I think about my grandmother’s delivery experience and feel that mine was so warmth less, and mechanical as compared to her experience. I wonder why didn’t I form such personal connections? My guess is that not all of us are fortunate enough to be blessed by the harbingers of humanity. This picture of my great grandfather Maganlal Mistry was taken in the 1920s and it is is one of the family’s most prized possessions – our connection to our roots. The photograph was taken to be sent to his brothers working in Ethiopia, Africa, and was hand colored with photo inks in 1937. It is interesting how the colouring is limited to his turban, we reckon it is because colouring of photographs was quite an expensive and sought after artistic skill at the time. My ancestors belonged to a village called Samoda in the region of Sidhpur (now in Gujarat) and they were exceptionally skilled wood carvers, in-layers and carpenters. The early 20th century was a time when many men (and women) from the Indian Subcontinent went to Africa to find work and make their fortunes. At first, my great grandfather Maganlal’s two brothers followed suit. They travelled by boat to the shores of the African continent and they found work as carpenters in the north east region of Africa, the Ethiopian Empire called Abyssinia at the time. The money was good, and they invited my great grandfather to join them there. However, Maganlal chose to stay on at home and began working as a government contractor building schools. Soon his work extended to several villages nearby. Maganlal, my great grandfather was not educated but he had learnt to write his name for signing building contracts. In his later years, he was made a member of P.W.D. (Public Works Department) Sidhpur office, and worked on large building contracts. What we know of this photograph is that Maganlal was in constant touch with his brothers and they sent him pictures they had taken in Africa. Inspired by those photographs, he went to a local photo studio and asked for his picture to be taken so he could send it to his brothers. What we see in his hand is a wooden ‘folding scale’ – an important tool of his trade that he insisted be captured in the photograph. Then a young man, Maganlal got married to a beautiful woman named Heera ben. She was a skilled cook and would teach other women to cook. Together they had two sons and a daughter. As he rose in influence and wealth around the district, he was made a member of the Caste Naat, or Panchayat of the village (a five member local government system). Anyone who went abroad was declared an outcast and upon their return, they would have to appease the village by offering a feast to the Panchayat and extended family, ask for their forgiveness to be re-included in the cast. All community problems were solved by calling upon the Panchayat at night, on a suitable day to resolve disputes such as matrimonial and monetary conflicts, quarrels between brothers and decisions of re-including and out-casting of people returning from foreign lands. All the while they were entertained with breakfast, lunch, dinner and other comforts funded by the parties involved in the dispute. Maganlal’s brothers in Ethiopia also did well. One of them, in fact, rose in the ranks to became a secretary to the King of Ethiopia, Haile Selassie and worked on the Ivory inlaying and carving of the royal throne for the king. It seems that at onset of the Second Italo Ethiopian War in 1935, Maganlal’s brothers however decided to return home for good to Sidhpur. We are told that they hid their earnings (gold coins) in their tools and mattresses. My great grandfather helped them resettle and get re included in village. Soon the brothers too found themselves a good repute and became influential heads of the community. Maganlal was a visionary man and invested his earnings in gold, real estate, shares of textile mills and a life insurance. We are told that he was very curious person. He would seek and share all kinds of knowledge with his children and make toys for his grand children. His lifestyle however remained simple and was usually found worshiping in the morning and rest of the time he worked. This is a photograph of my paternal grandmother Manorama Rao when she graduated and topped English Honours with the Grigg Memorial gold medal at the University level. My grandmother was born into a Saraswat Konkani Brahmin family in Madras (now Chennai) in 1917. She was the eldest of three daughters in a progressive family that encouraged education and goals. Her mother (my great grandmother) Kamala Devi Tombat was a progressive lady with immense willpower. My great grandfather, Kamala Devi’s husband, Anand Rao Tombat had hired a British tutor to teach her English after their marriage and encouraged her to learn music. After her husband’s passing in 1944, Kamala went on to do a Visharad in Hindi (equivalent to a Bachelor’s degree), became a Hindi Pandit (Brahmin Scholar) and then a Professor of Hindi and Sanskrit at Queen Mary’s College, Madras, one of the first three colleges for women in the country. She wrote and composed devotional songs and even published a book with them, named Shri Gurugeet Bhajanmala priced at a mere Rs 1 in those days. She and her daughters regularly sang on All India Radio too. Not only does my grandmother Manorama bear an uncanny physical resemblance to her mother, but the musical, literary talent and zest for life have been passed on as well. After schooling at CSI Ewart School and Presidency Training School, Madras, in 1937, my grandmother Manorama joined Queen Mary’s College where she topped the entire Madras Presidency in English and was awarded the Krupabai Satthianadhan Gold Medal for proficiency in the English language. She then joined the BA Honours (English Language) and Literature course at Presidency College, Madras while her sister Sushila opted for Botany. Both commuted each day by tram between home, and college, that had a beautiful and sprawling campus overlooking Marina Beach, and my grandmother tells me that she was very fond of looking out at the expansive waters of the Bay of Bengal from her classroom window. She also recounts that there were less than 10 students in English Honours, and that they had papers right from Old English (Beowulf) to Middle English (Chaucer), the Romantics to Shakespeare. She also narrates that many of her professors were educated at Oxford and Cambridge. In 1939, VK Narasimhan from The Indian Express (later Editor-in-Chief) was looking for superior English language and writing skills. My grandmother fit the bill perfectly. Eager to put her education to use and supplement the home income, my grandmother joined the newspaper. She gathered news items, wrote literary reviews and edited articles. That same year, she was introduced to a young England-returned barrister by name Udiavar Narayana Rao. Perhaps he was drawn to her for her good looks, her outgoing and sociable nature and above all, her intellectual capabilities and following a few months of courtship, the two married on 23 May, 1940. The wedding took place as per Hindu rites at Munagala House which eventually gave way to Hotel Ashoka in 1974. My grandfather, Udiavar Narayana Rao was born in 1910 into a well educated and accomplished Goud Saraswat Konkani Brahmin family. During his years at college, he was also a member of the University Training Corps, a precursor to the modern-day NCC (National Cadet Corps). Subsequently, he became a Bar-at-Law from London’s Middle Temple, and returned to India in 1936, where he joined as an advocate at the High Court of Madras. To this day, my grandmother talks of my grandfather with awe and deep respect for his character and achievements. He was a man of few words, and respected for his upright character in both personal and professional circles. My grandfather died prematurely at age 54 in 1965, while still in service of the Karnataka Government. After my parents married in 1970, and my father got his first job in Hyderabad, the family moved to Hyderabad. In 1969, when my grandmother was around 52 years old, she traveled overseas for the first time to the US to see her daughter Geetha. But before landing on the shores of America, the adventurous middle-aged soul broke journey in Europe, where, for about 10 days, she visited places like Rome, Paris and London, taking in all the sights, sounds and scenes of life there. Coming from a country that is still dealing with the issue of educating the girl child, my grandmother was definitely way ahead of her time. This month on October 8, 2017, my grandmother, Manorama became a centenarian, celebrating her 100th birthday amidst family, friends and her many admirers. She is still one of the most organized persons I know and has meticulously maintained family pictures and documents. She labels them at the back and keeps them safely in her cupboard. She also saw the potential in me to be a writer and encouraged me to be one. Today, we’re four generations living under one roof, and are happy and proud to have her as the matriarch of the family. While clearing a godown in our house in 2015, I chanced upon a wooden box with a sliding cover. On close inspection, it contained ten 10”x12” B&W glass negatives photographed between c. 1897 to 1910, covered in cobwebs and fungus. It turned out to be part of my grandfather’s photographic portfolio. My grandfather, Maharajkumar Brajendra Kishore Dev Burman of Tripura was an avid photographer and a gadget freak. Up until now only few prints of my grandfather’s early work existed and had never before been seen or mentioned outside of immediate family. But discovering these negatives revealed a whole different level of quality and scope than what we had seen before. Later I discovered 36 more glass negatives, dated c.1890-1925, in cupboards wrapped up in newsprint, albeit not in very good condition. This is a photograph of my grand-uncle Maharaja Birendra Kishore taken by my grandfather, his brother, Brajendra Kishore, a year after my grand-uncle became the King of Tripura. They were both 24 years old. My grand-uncle was born in 1883, just 3 months before my grandfather (their mothers were sisters). He was a gifted painter, singer and songwriter. The painting you see on the left,‘The Hermit’, was his adaptation of Job (1880) by Léon Bonnat, an Italian painter. In those days it was quite usual to copy other artists works, and family stories tell us that the painting was sent to Paris, France and won a prize for the best copy. Several of his paintings now hang the palace and other residences of the royal family. The rulers of Tripura were among the pioneers of Photography in the Indian Subcontinent. My great great grand father Maharaja Bir Chandra Manikya was the architect of modern Agartala (capital of Tripura), and an enthusiastic photographer. He acquired one of the first two cameras that came into Subcontinent (the other was purchased by Raja Deen Dayal, perhaps funded by the Indore state) and was photographing Dagguerotypes in the 1860s. He kept up with all the newer techniques of photography. Culture and arts flourished in the kingdom under his rule. He was the first person to recognize Rabindranath Tagore to be accomplished genius and awarded him when all of Bengal was critical of his early work. He even provided regular financial assistance to Santiniketan, a practice that continued with his son Radha Kishore & grandson Birendra Kishore (above). 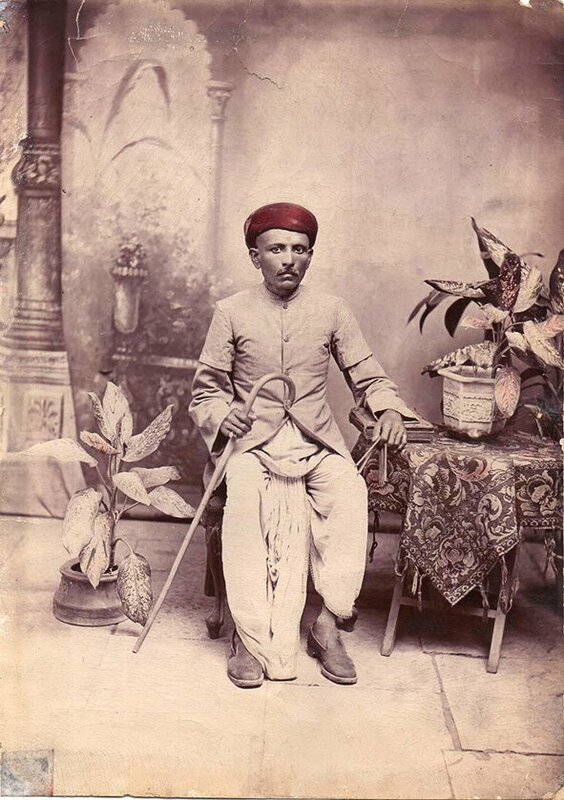 In those days most subcontinental photographers followed the European style of making portraits – with backdrops, and props & clothes to mimick the pictures they saw as examples. I hear there was a studio setup constructed in the palace in which backdrops & props were changed whenever they got bored of it. Photography was also achieved in collaborative ways. Exposures of 10-20 seconds, plates and paper had to be sourced from Calcutta, and that was a rather tedious journey as well as a long wait. Soon the king constructed his own dark room, learnt the developing and coating process and began importing his own chemicals and accessories. His passion for photography, its dissemination and developing also got the family involved. His third wife Monmohini is said to have been an amatuer photographer, whom he tutored to develop and make prints. Perhaps the first selves-portrait in India (1880) was of them together in a fairly intimate photograph using a long wire shutter control. He established a club called the “The Camera Club of the Palace of Agartala” and what we must assume was a first, an annual photo exhibition in the subcontinent at the palace. Bir Chandra‘s sons were also keen photographers. Samarendra (Bara Thakur) my great grand-uncle, was a prolific photographer and regularly sent his pictures to England for competitions. His work & writings on Photography are well documented and one of his most well known pictures of a tribal girl is held at the British Library. He even experimented with methods to preserve negatives in Indian hot and humid weather conditions. His own father was known to comment- “Samarendra’s paintings and photos were near flawless”. The other son Maharaja Radha Kishore Manikya, my great grand father was also a keen photographer and succeeded the throne in 1897. Unfortunately, no negatives of their works have been found so far. My grand-uncle Birendra Kishore and my grandfather, Brajendra Kishore also took to the new medium. Of the two, my grandfather was more involved with photography, its technical aspects and was an expert at coating the plates and paper. I find this image so telling of their bond and as an ode to their exchange of ideas, because the photograph is of one brother – a keen painter, taken by the another – a keen photographer. My grandfather, the photographer of this image, Brajendra Kishore had a passion for all the new things invented in the world and experimented with everything. He serviced and repaired all the royal cars and pocket watches. He loved to carve wood & ivory, and make furniture. Of course photography was a passion as it combined the aesthetic, mechanical and chemistry that he dabbled in anyway. He would coat the glass negatives and paper, and process and print for most of the family and taught others how to do it. He had a darkroom with a hole in the ceiling where the sun was the source of light for the enlarger. Not all of his images have survived the test of time, but this image is one from his collection of negatives that have. Through my childhood I met my grandfather often, though only during school holidays. He taught me to shoot (with a gun) at the age of about seven and after a few years, to hand-color B&W photographs. Unfortunately I found photography to be my own keen pursuit only just before he passed in 1976, so I could not discuss any of my discoveries about photography or his pictures with him; else I am sure he would have told me about these plates, and asked that they be looked after. Nonetheless, I am proud that we are probably the only family in the subcontinent who have engaged with photography as pioneers and later as practitioners for five generations. My father, Nirmal Chandra Kumar, born in Calcutta, Bengal in 1917, and was the eldest of seven children. After graduating from school at Mitra Institute, he went on to study at Bangabasi College. My grandfather was a trader and the family had a large Departmental Store at Shyambazar Crossing and a home at 52, Mohan Bagan Lane. My father grew up to be an avid reader, hungry for knowledge and to make a living, he worked several odd jobs and tried his hand at writing, which in his own words he said he failed miserably at. In the early 1940s, after my father got his own place in Calcutta, he met an illiterate Muslim bookseller by the name of Yakub and began helping him read and organize his books. Yakub encouraged my father to trade in books; a venture that was not going to particularly help in making a living, yet in 1945, my inspired father opened a book-shop in his house, called Kumars and began collecting rare books and documents. He combined his pursuit with a broader interest to serve the society around him. In 1950, my grandparents also arranged for my father to be married to my mother Karuna, a school teacher from Adra, (Bengal and Bihar border) and my father continued working on his collection. Kumars, my father’s book-shop, if it could be called so, spread over several rooms in his residence, around divans and reading chairs, and looked more like a personal library in a living room. In the 1940s, rare book collections were in a dismal, class-bound rut. The famous rare book-shop Cambray was already fading, Thacker & Spink, another well known bookshop was alive, but there were hardly any rare books. With a growing collection of rarities at my father’s book shop, it soon became was a hub for book lovers and a meeting point for people from all walks of life, ranging from iconoclastic artists to conservative writers. With books on art, travel, ornithology, botany, history, literature, mountaineering, religion and Indology as its strengths, Kumars soon became the place to go. At the shop, my father could be found wearing a white collared half sleeved shirt, and a Lungi, (stitched or unstitched cloth worn around the waist) or a Dhoti and Kurta with pump shoes. We can’t even imagine somebody wearing an attire like that and smoking a pipe or a Davidus Cigar sitting in a library surrounded by books now. My father had several agents buying books for him at auctions and establishments abroad such as Foyles, Bernard Quaritch and Sotheby’s. One of his many enthusiastic collections included the then unheralded works of British Painters, uncle and nephew, Thomas Daniell and William Daniell. He bought an elephantine Folio of 144 Views of their works from Sotheby’s, and had it sent to Calcutta. On the way it got damaged that resulted in a bitter battle with the shipping company, MacKinnon McKenzie records of which can be found in Calcutta High Court. Much of the folio is now entrusted in care of the museum The Victoria Memorial. When Satyajit Ray, the filmmaker, began his research on the Indian Rebellion of 1857 for his film Shatranj ki Khilari (The Chess Player), he depended on my father for information on the subject. Kumar not only provided him with all the relevant books, but also went out of his way to bid for a rare scrap book on the 1857 Mutiny, at a London Auction that contained paper clippings and notes on the event, and later he also provided him with many antique props for his sets. Ray it seems did not forget this gesture and paid my father his biggest personal tribute. He based one of his characters in his well known Feluda series on Kumar – the character Sidhujata (Sidhu Uncle), a man with vast encyclopedic knowledge on several subjects. If rare works and books of painter William Hogarth, writers Colonel Sleeman, George V Higgins, James Hamilton, the unknown Bishop Heber, Scottish writer O’Malley, African Missionary Traveler David Livingston and Sir Richard Burton were easily available in Calcutta to the literary landscape, it was in no small part due to my father, Kumar’s efforts. My father also convinced several people including Satyajit Ray to bid for rare works and if Lahari, the then Superintendent of Calcutta Zoo has been able to leave behind the rare collection of Himalayan Birds, books on Ornithology and Wild-life to the collection of The Zoological Gardens, it is again because of my father. Kumar introduced several artist works to Calcutta; mainly the Flemish artist, Francois Balthazar Solvyns, whose works constitutes the first ‘ethnographic survey’ of India or more precisely of Bengal. As the 1960s moved into the 1970s, Kumars was a resource for international researchers, but my father was not able to cope as much of its collection had now begun to fade away. His health had deteriorated and much of it was due to a domestic crisis of two of his children becoming members of the Naxalbari Movement (Revolutionary Communist Party). With a pipe smoking habit, conversations in mono-syllables and interrogative questions, he began to resemble the eccentric film director Alfred Hitchcock. Soon he became a recluse and his once dazzling library dimmed. For 30 years, he had presided over a vast rarest of rare collections in his own bookshop, Kumars, a pre-eminent institution. He was the first in the subcontinent to publish a catalogue of books in his collection. He even formalized the literary scene by initiating regular readings in the bookshop, an innovation at the time. By the end of the 1975, the rare book trade became thoroughly commercialized; books began to be torn for their prints and sold separately. My father did not want to be a part of this and lost out. Nirmal Chandra Kumar died in 1976 of a cerebral stroke, aged 60 and this year, in 2017, is his centenary. He was a genuine antiquarian and possibly the greatest influence on a generation of artists, filmmaker, writers, musicians, activists, teachers and travellers – perhaps more than any art critic or editor of his time. With his death, the literary world lost an extremely generous and unselfish man who gave of his vast knowledge and delighted in the achievements of those he had influenced so profoundly. My great great grandparents. Hyderabad State, (now Telangana, India) Circa 1910. This photograph may have been taken in Warangal, Hyderabad State, (now Telangana, India) or Garla, Hyderabad State, (now Telangana India) more than hundred years ago, circa 1910. 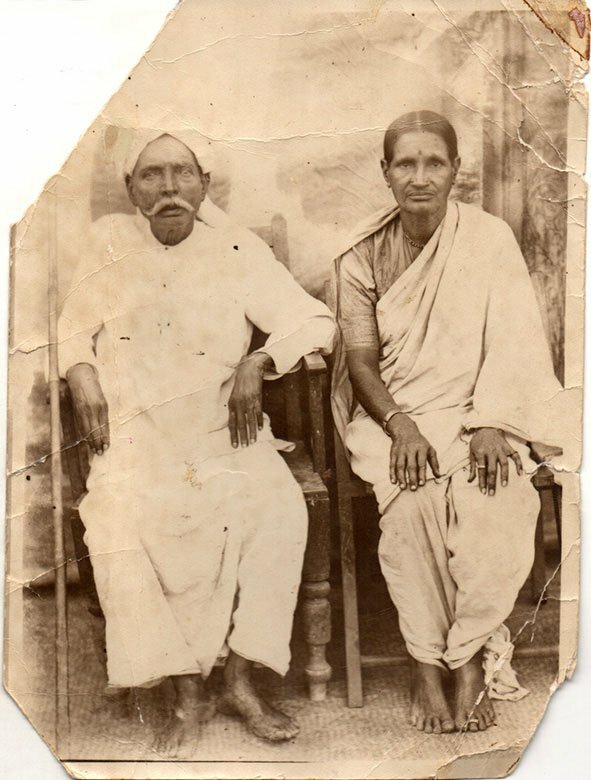 The old man in the photograph is Mateti Ramanujana Rao and his wife Cheruku Ranganayakamma. And they were my great great grandparents. The origin and journey of this photograph tells a tale of middle class family in the southern region. Matati Ramanujana Rao worked as a Jemadar, equivalent to today’s head constable, in Warangal Central Jail under the sixth Nizam of Hyderabad, Mir Mahboob Ali Khan Siddiqi Bayafandi’s rule. In a Muslim dominated state, being a Brahmin/Hindu didn’t helped his upward mobility, but since he was a salaried person, he could afford a photograph. I don’t know much about his life, but that he was survived by two sons and four daughters. Both his sons were Patwaris (village administrators) and my paternal grandmother is the daughter of one of his sons. When my father visited his native village Garla, (formerly Hyderabad State), he discovered the glass plate negative of this photograph in the trash. Grasping its heritage and family value, he tried, albeit in vain, to convince his relatives to take care of it. Later, he took it upon himself to develop it into a photographic print at a photo studio in Jammu (of Jammu & Kashmir), where he was stationed as an Airman in the Indian Air Force. He even distributed copies of the photo to all his relatives to increase the chance of its survival. After a decade or so, the glass negative broke, but the photo was safe in our family album. Interestingly, almost all other copies of this photograph were lost, either by negligence or the relatives decided to not hold on to it. Around 20 years ago, my parents returned to Hyderabad, Telangana, and it seems that our last surviving photographic print of this image was misplaced, moreover it even got forgotten. I remember, a decade later, when I got married and was settled in Boston, my wife was displaying her childhood photos on the refrigerator, and wondered if I wanted to add some of my own. I called up my father to send me some of my childhood pictures, but during that conversation, I mentioned this obscure old photograph in our family album. My father turned his house upside down and found it. He photographed this image with a smart-phone, but yet again, somehow we lost the print and today it exists only as a digital photograph. I never met this man or his wife. I only know them as my ancestors, my great great grandparents. However, my father and I have somehow felt strongly about holding onto this photograph, for as long as we can, and today we share it with the world. This photograph is a testament of our heritage, and our origins in remote and rural parts of the south, to the north of India and onto overseas shores. It was in the fall of 1900, that the Maharajah of Travancore adopted the two girls in this photograph (taken in c. 1905), as his Maharanis — and as his ‘nieces’. For in Kerala, queens were never wives of monarchs, but their sisters. Under the matrilineal system of succession, ranks and titles passed in the female line; the Maharajah was a ruler not because his father was king before him, but because his mother was queen. The Maharajahs of Travancore (now central and Southern Kerala, India) inherited the crown from their mother’s brothers, and thus power passed in a topsy turvy fashion from uncle to nephew, down the generations. Naturally, then, the sons of kings from their own wives were not seen as princes, but were only exalted nobles of the realm, fated for oblivion after the deaths of their royal fathers. Instead, princely dignities were granted to sons of royal sisters, and it was these boys who were considered heirs to the throne. In 1900, however, the Maharajah had no heirs through his sister, and so the two girls seen here were adopted. They were cousins, and granddaughters of the famous artist Raja Ravi Varma. Sometime before the princesses were born, their mothers had journeyed to Rameswaram (Tamil Nadu) on a pilgrimage to pray for the birth of daughters to them. Legend has it that the deity appeared to them in a dream and promised the fulfilment of their desire. And thus when the girls were born, they were named Sethu Parvathi Bayi (left) and Sethu Lakshmi Bayi (seated right) respectively, with the prefix ‘Sethu’ denoting their divine origins from the lord of Sethu Samudram in Rameswaram. When they turned 10, a set of boys from the aristocracy was presented to them to select one each as their consorts (the men were never officially called ‘husbands’). Though these consorts were wedded to the Maharanis, they were considered subjects: they lived in separate palaces and only visited their royal wives when summoned; they had to bow to them and refer to them as Highnesses. In public, they were prohibited from being seated in the presence of their highborn brides. The little Maharanis spent several years playing hopscotch with their husbands, and reading fairytales together in the palace library until in their teens the marriages were consummated on nights when the stars were in perfect alignment. It was the Junior Maharani Sethu Parvathi Bayi who gave birth to a boy, Chithira Thirunal, in 1912. But until he came of age, for over seven years, the destinies of Travancore were entrusted to the Senior Maharani Sethu Lakshmi Bayi, who had two daughters but no sons. Power corrupted relations between the two royal matriarchs and records speak of the Junior Maharani as ‘the villain’. She felt that as mother of the future Maharajah, she ought to have been allowed to rule Travancore on his behalf and not her sister. But law and tradition decreed that only the Senior Maharani could reign. So it was Sethu Lakshmi Bayi who ruled Travancore in the 1920s. She initiated far-reaching reforms constructing highways, bringing electricity and telephone services to her people, spending nearly a fifth of her revenues on education, which augmented Kerala’s high rate of literacy, developing Cochin (now Kochi) into the modern trading port it is today, appointing the first female minister in India, employing hundreds of educated women in her government, and thousands as teachers and nurses, installing the first Dalit and Muslim judges in the state, selecting a Christian Prime Minister instead of a traditional Brahmin or Nair; and opening up public roads to all in Travancore, hitherto accessible only to high caste Hindus. By the end of 1931, the Senior Maharani relinquished power and handed the mantle of state to her nephew Chithira Thirunal, the Junior Maharani’s son. By then relations between the sisters had deteriorated irreparably, with palace intrigue, black magic, and more vitiating the air at court. For the next many years, the Senior Maharani, despite her acclaimed services to the five million people of Travancore, lived under the vexing control of the Junior Maharani. British authorities noted that while the Senior Maharani was ‘popular and respected’ and ‘held in the greatest reverence and esteem throughout the state’, the Junior was ‘cordially hated’ by their subjects, and was a ‘jealous and masterful’ modern day Catherine de’ Medici. There was perhaps bias, for the Junior Maharani who showed great independence and held unorthodox views, but the man on the ground held her in fear, and not love. In 1947, when India became independent, the Senior Maharani’s family sensed relief and freedom from control of the Junior Maharani. Her daughters moved to Bangalore and Madras (now Bengaluru and Chennai), leading new lives as ordinary citizens; they cooked their own food, drove their own cars, and brought up their children as regular citizens. In 1957, the Senior Maharani decided to leave her palace and renounce her royal past. From being ‘Her Highness Sri Padmanabha Sevini Vanchi Dharma Vardhini Raja Rajeshwari Maharani Pooradam Tirunal Sethu Lakshmi Bayi Maharajah, Companion of the Imperial Order of the Crown of India and Senior Maharani of Travancore,’ she retired to Bangalore simply as ‘Smt Sethu Lakshmi Bayi’. From a palace with 300 servants, she moved into an ordinary bungalow with a staff of seven and spent the remainder of her days as a quiet recluse. She gave up her palaces to the people of Kerala; her summer palace is now with the Agriculture College; her official residence is a medical research institute; her beach resort was given to the ITDC. And thus ended the saga of the two Sethus, daughters of providence adopted and raised to princely ranks, with one dying as a nobody, faraway from the land she loved and served, and the other meeting her maker in the comforts of her palace, still a queen long after time dissolved her kingdom into the pages of history. Winner of the 2017 Sahitya Akademi Yuva Puraskar, Manu S Pillai is the author of the award winning book ‘The Ivory Throne: Chronicles of the House of Travancore’. The book can be purchased here. 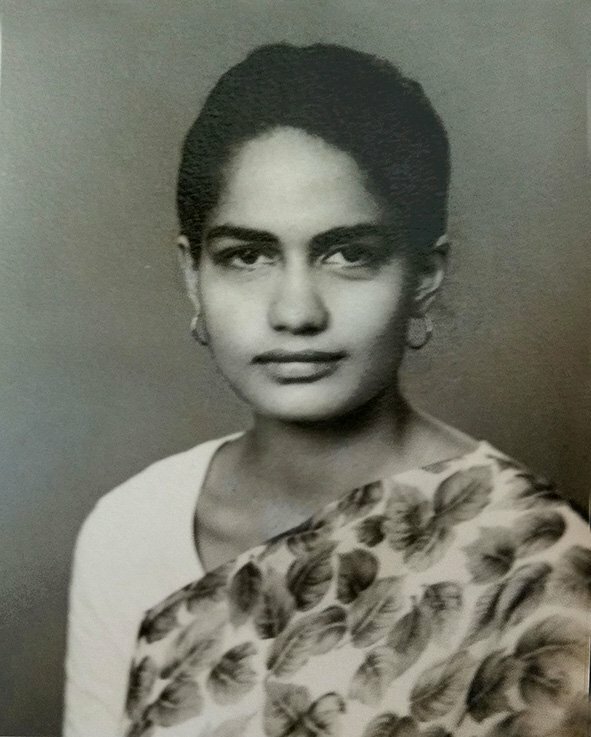 This is a photograph of my mother, Lalitha Mandana (née Belliappa) and it was taken around the time when she was 18 years old. Born on January 18, 1940 to Kodava (Warrior community of Coorg) parents in Tabora, Tanzania, my mother and her four siblings lived in Dar-es-Salaam, Tanzania or (formerly Tanganyika), till the age of 18. My Tatha’s (grandfather) name, was Chendrimada Kuttappa Belliappa. He came from Madikeri, the capital of Coorg (now in Karnataka State). In 1919, at the age of 15, he ran away from home and managed to reach Bombay, where he bet on a horse and won Rs. 50. He immediately boarded a ship bound for South Africa and paid his boarding and lodging by working on the ship. We don’t know how he survived till his 20s but at the age of 28, he returned to marry my grandmother, Biddannda Seetha Achaya who was a 18 yrs old from Pollibetta, South Coorg (now Mysore district). She was the youngest of seven children ( born July 12,1914) and had just completed high school – She was brilliant, but naive. She was happy to be married to Thatha so that she would get her new sarees as she was tired of wearing her sister’s hand-me-downs. Eventually my grandfather became the Chief Clerk in the East African Railways and Harbour, while my grandmother became a middle school teacher at the Aga Khan Girls High School. My mother whom I call ‘Ma’ is the third born among her four siblings, her dark skin and dusky features always set her apart from the others. At the tender age of two, just after World War II, she was sent to India to live with her mother’s elder sister, for four years. The aunt had five children of her own, but included Ma as her own. My mother says she was usually left to herself, which in retrospect, she considers a blessing. A keen observer, Ma watched and absorbed the talents of her new mother who was an extremely skilled, kind and spiritual person. At the end of four eventful years, my biological grandparents, returned from Africa to pick her up, but my mother announced that her adopted family was her family as she knew it and she did not want to return. Nonetheless, she went back home with them to Africa, where she started life anew, struggling to fit in with her own siblings. Things were tough for Ma there – she was aware of her darker skin, and the troubles it caused her – it wasn’t easy to fit in. My mother held the memories of her time in India close, with a decision to find a way back to the place she knew as home. In 1946, Ma, a non-English speaker, was enrolled into St. Josephs Convent run by Swiss nuns, where she was introduced to the quasi Waldorf system of education. In the matter of a year, by the age of seven, she had grasped English. She learnt to knit and crochet by the time she was eight, and stitched her own clothes at the age of 11. By 12 she had exhausted all the stitching sets imported from England and graduated to using the sewing machine. By 13, she was perming her own hair and her friends. She steadily acquired several skills, but was not encouraged to question any of them, so much of her learning took place by challenging herself. At the age of 15, she watched a tailor cut and stitch a dress. When she returned home, she chopped her mother’s beloved voile sari and created a beautiful flared skirt, much to her mother’s horror. 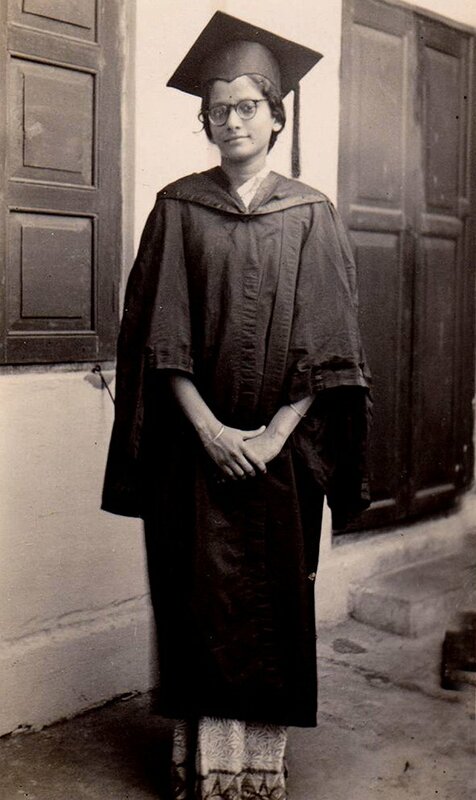 Although, Ma had the opportunity to pursue medicine in England she chose to come back to India and earned her own passage to India in 1958 at the age of 18. This photograph was taken around that time, a little after she reached India. When she didn’t secure a seat in medicine, she pursued her next best love, art and went on to complete her MA in History of Fine Arts/Architecture/Sculpture and Painting, from Stella Maris College in Madras (now Chennai). Unlike what society considered appropriate in those days, she got married much later, at the age of 31 to my father, who is five years younger than her. She went on to do her Montessori training, followed by her B.Ed, and became the head mistress of a school with 600 hundred children and me (I was all of seven years old). In the years after that, she went on to pursue her first love, healing & medicine and eventually learnt Homeopathy at the age of 39 and started her own free clinic when she was 42. Decades later, she became a teacher again when she founded Promise Centre Kindergarten in Bangalore, making us the first Waldorf kindergarten in Karnataka. I took over the reigns from her in 2009. My mother has redefined a mother-child relationship through her parenting and grandparenting style. She maybe one among a handful from her generation who can even claim to have an amazing relationship with their child. We had conversations with each other that I never heard other children having with their parents and most times still don’t. She climbed trees and rocks with the children at the school until an accident left her with a broken leg at the age of 70. Although, the broken leg troubles her, she doesn’t let it get in the way of all that she loves to do, from parent education to being a core member on the board of trustees at Advaya Shaale, the second Waldorf Grade school in Bangalore (now Bengaluru, Karnataka). My grandfather Surendra Behra (right most in striped blazer) with his hockey team mates. Utkal University, Cuttack, Orissa (now Odisha). November, 1949. 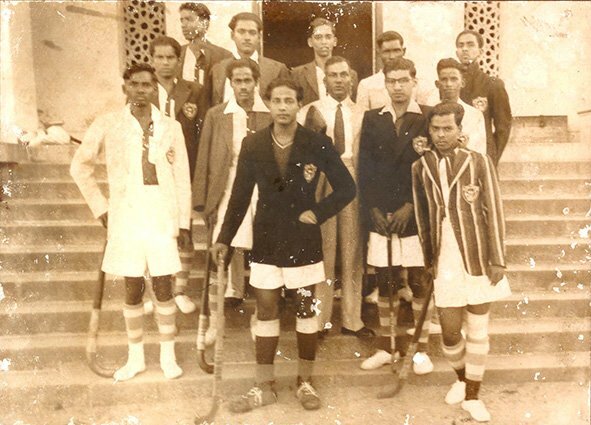 This is a picture of my late maternal Grandfather, Surendra Behera (Right most in a striped blazer) from his Utkal university days when he played Hockey for the Orissa state team in 1949. At the time, he was 24 years old and studying Law, after graduating in Arts from Ravenshaw College (he did not complete his law degree). The people in the photograph were from different colleges under Utkal University. 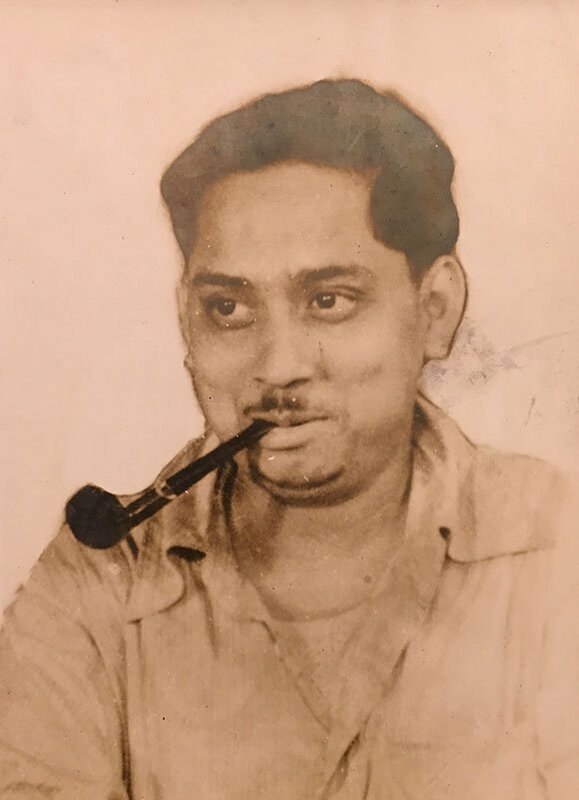 My grandfather whom we in the family fondly called Aja (grandfather in Oriya) was born in Cuttack, Orissa (now Odisha) in 1925, in a large joint family of 30 members and his own father ran a sweets shop business. When Aja grew up, he was known as “Sura Bhai”, and was a dearly loved man by his family and friends. After his marriage, my Ayee (grandmother) and Aja together had four sons, and a daughter. By the mid 1950’s, Aja became the Captain of Orissa State Hockey Team and was awarded the “Blue” award by Utkal University authorities in Odisha. The honour of “Blue” was given by universties to students proficient in sports, with unblemished character, were deemed well-behaved and were lovable to peers & superiors. My grandfather received the Ravenshaw College Blue, Utkal University Blue and the Madhusudan Law College Blue for representing these institutions and Hockey Team impeccably. Professionally he began working with the Secretariat of the Government of Odisha, in the Revenue Department, though even after retirement, in his 60s, he continued to be associated with State Hockey Association and worked as Coach and then referee for quite a long time. I loved my grandfather. He was a wonderful person, revered by everyone who knew him. For most of his life he had a steady string of family and friends visiting him. As a lifestyle, Aja lived simply, with immense love in his heart for everyone. He never depended on anyone, even in his last days, for anything. He ironed and washed his own clothes and insisted on ironing everyone else’s too. As a rule he never came empty handed for his wife on pay or pension day. We are told that he would ride his bicycle to get his pension and go straight to Odisi and buy my grandmother, my Ayee, a gift. He loved eating and secretly bought Cuttack’s famous street food, Doi Bora – Alu Dom without Ayee’s knowledge. When we visited, he bought it on the pretext of treating us. I remember, he had a cupboard full of interesting things he had collected over the years – Photographs, pens, binoculars, medals, shields, and a pocket microscope which I now have in my possession. I remember as children would beg him to let us have a peek into his treasures. Till his last days, he helped several players in need, with sports accessories and provisioned medicine to the needy with his own money. He was adored by youngsters who aspired to play Hockey but didn’t have the means. Aja was was the only person in my family who never asked me about my exams, but instead how many medals I had won in sports. To his joy, I did have a few sport wins in school. Nonetheless, no one in our generation has come anywhere close to achieving what he had in his lifetime. On March 5, 2002, he was felicitated by the Department of Sports & Youth services, Government. of Odisha, for elevating the prestige of the State and for his commendable contribution in the field of National/International Sports. The honour is similar to a Lifetime Achievement Award given by the state to veterans in different fields. His contribution to sports in general & Hockey in Odisha, in particular, was widely recognized through awards won by him. He was awarded by the Speaker of Lok Sabha (Indian Parliament), Sri Rabi Ray & Chief Minister of Odisha, Sri Navin Patnaik for his invaluable contribution. Aja passed away of old age on April 11, 2013. My third uncle (and his third son) plays football for BSNL (a public sector company) and was their Team Captain for a number of years. My father Subhash Goyal was born in 1968. He grew up in Bathinda, Punjab with four of his siblings (two elder sisters and two younger brothers) and a large extended family of 19 cousins, innumerable aunts & uncles, all of whom lived on the same street. This photograph of him as a young teenager is special to me and when I asked him about it, he tells me that it was taken when he had gone for a trip with his parents to the much revered Vaishno Devi Temple after his Board exams. 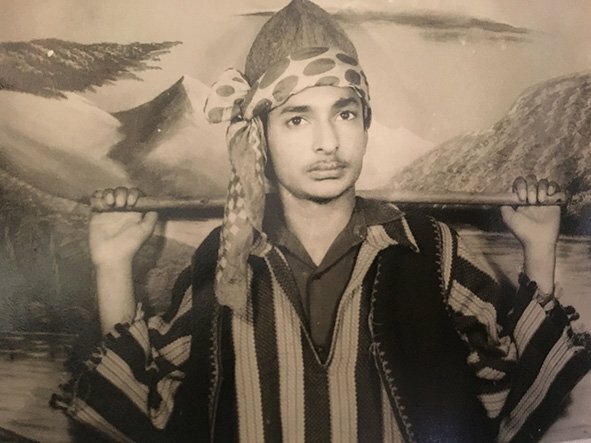 He spent half of his pocket money (5-Paisa) to secretly get this photo done in a studio in front of an old camera in Kashmiri attire. The idea of a solo photograph was fascinating to him. My great grand father, Roshan Lal Katia was a senior advocate in Punjab. He had 11 children who multiplied the family gene further with 24 more – my father being one of them. He recalls that my great grandfather had a taste for luxury and was a forward thinking man. He educated all his children, including the girls – all of whom became renowned doctors and lawyers. My father primary school was Summer Hill convent and then high school was St. Joseph’s Convent where all his cousins studied too. When he grew up, he chose to become a business man. My father has always been immensely fond of travelling, and often reminisces about his family’s expeditions to several places including Agra and Rishikesh in Uttar Pradesh. He enjoyed travels on trains for simple pleasure of buying tea and snacks whenever the train would halt. He and his two younger brothers would buy small toys like marbles from vendors on the platform. Returning from a holiday would also mean bringing back sweets for the neighbors and telling them stories of their visits. He remembers he used to get 10-paisa as pocket money that would be spent on snacks and sometimes to buy kites. The back lane of his home would clog rainwater during monsoons and all the children would make paper boats to sail in clogged waters. He tells me, the children would get new clothes on special occasions, and like in many Indian families it would be made from the same roll of fabric, making them all look identical. On those special occasions Samosas were a delicacy. Interestingly, he remembers his first birthday celebrations, where Samosas and Chola Bathura were served with ice cream made of milk fat. My grandfather, he says had a special fondness for him, for he was the only one who had a cycle and that too it was red. The day that cycle had to be delivered, he went to the cycle shop at 7 am in the morning and sat all day at the shop to make sure it was modified according to him. He would clean his cycle everyday after school and run errands on it. In 1984, my father went of his first international trip to Nepal with school friends and later to Thailand in 1989. In 1987, his first trip to Bombay (now Mumbai) was a special one as he went to the famous Taj Hotel at Gateway of India, for High tea and attended a Bollywood night. My dad’s uncles, and my grandmother still live in Bathinda and we migrated to New Delhi when I was born in 1991. In a small effort to capture that curious spirit to explore, travel and small pleasures, I have documented my father’s journey through his childhood in Punjab here. I was born in London (UK) in 1936. My English-Italian mother, Marjorie Frank-Keyes was a concert singer and my father Suresh Vaidya was a successful young writer. He was also on the editorial board of Time Magazine in London. My father was arrested by the British authorities when he refused to join the British Army to fight in World War II. He declared he would gladly fight as a free man, but not as a colonial subject. He was imprisoned in Canterbury and fought and won a case in the British Court. His case was defended by well known lawyers like Sir Fenner Brockway and Lord Reginald Sorensen. In a landmark judgment, the court ruled that the British Army could not compel a person to fight because he was a colonial subject. Of course I was one my feisty parents’ two daughters. I completed my schooling in London then in Bombay (now Mumbai). Later I graduated from Miranda House, standing third in Delhi University. I was also actively involved in theatre and was awarded the best actress for performing sections from Bernard Shaw’s Saint Joan. Later, I began working with Link Magazine in Delhi as a journalist that also had a daily paper called The Patriot. Gopal Sharman was suggested to us as an independent writer who could write very well on the arts. Up until then I had been writing them. In the 1950s, at the office, I was in charge of putting the month’s issue to bed and I had been told that Gopal would come by with the copy on the Arts columns. He came to the office early and sat several glass cubicles away, typing away, but by late morning the copy was still not done and I began to lose patience. I went bossily through the cubicles and asked him about the text. He looked up and said “Don’t go through the roof, this isn’t a spoof, I am writing it and here it is.” and that’s it, we fell in love. I have no idea how, why and what it was, but that’s how we met and were together since. We began to live together in a garage in Bengali Market. Later, we got married. Gopal at the time was also writing two popular columns under a pseudonym – Nachiketas for the Indian Express and the Sunday Standard. One was about artists and the other was about the Upanishads, Vedanta, mythology, questions on philosophy, life and death. Unknown to us the time, the second President of India, Dr. Sarvepalli Radhakrishnan was a fan of Nachiketas’s (Gopal’s) columns. In early January of 1966, Dr. Radhakrishnan underwent a cataract operation. Unable to read and restless, he asked a close friend Prof. K Swaminathan who had edited the Collected works of Mahatma Gandhi and was a former editor of Indian Express, to find out who was this ‘Nachiketas’ person writing these fascinating pieces, and to invite him to the Rashtrapati Bhawan (Presidential Residence) for a narrative session. Prof. Swaminathan found Gopal and was surprised to find out that it was a young man who went about on a bicycle, with a shock of unruly hair, and wore a polo neck shirt & trousers. He asked Gopal if he would come and read his works to the President. Gopal happily agreed. When he returned home, Gopal told me about the President’s request and insisted that since I was much better at it, I should perform Gopal’s Full Circle for the President. Full Circle was a dramatic recitation of stories and poems with philosophical concepts narrated with voices of regular people. I would perform and recite the stories & poems, while Gopal, a classically trained singer, would sing songs ranging from Meera Bai’s bhajans (songs with spiritual themes) to songs written by the poet, philosopher and politician Muhammad Iqbal. After some reluctance, I agreed and we both decided to go. I always needed glasses to read, but since I didn’t want to read off a paper, I learnt all of it by heart. When the day came, a big Rolls Royce came from the Rashtrapati Bhawan to pick us up, along with the formal invitation. To our shock it mentioned my name, but left Gopal’s out! We informed the officials about the confusion, but they did not accommodate the mistake and no change could be made. Nonetheless, now there was no turning back. Gopal came along with me up till the Rashtrapati Bhavan’s reception, wished me very well and went off to another meeting. I still remember watching him walk down the slope of that road. When I was escorted upstairs, the door was opened by the President, with a bandaged eye. He exclaimed “Ah Welcome! But where is the poet? !” I explained what had happened, he insisted a car bring Gopal back, but with 20-30 people in the room including foreign dignitaries already seated, it seemed a bit awkward so we let the matter rest. I began to narrate the pieces, and I remember now and then the very impressed President would interrupt to explain the contexts to his guests and what was being said. When I ended the performance, Dr.Radhakrishnan was extremely happy. He had loved every bit of it. He insisted that this work should be performed for a proper audience and that he will have ICCR (Indian Council for Culture Relations) arrange a performance at Azad Bhawan. And so it was arranged. When we went and met the director of ICCR, Inam Rahman, I think he was a bit put out at the order of accommodating young unknown people. Perhaps to be a bit difficult, he said the only date available was January 13, only a few days after, and will we take that? Gopal and I looked at each other and immediately said yes. The ICCR invited many well-known people & important dignitaries from the Embassies, and they all loved Full Circle. After the performance we received invitations from the Embassies of Yugoslavia (now seven independent states) and Italy to perform in their countries. But there was a hitch, ICCR refused to pay for the tickets, and we had to find the tickets on our own. We wrote to Air India and asked if they’d like to sponsor us. They wrote back and said they could, for one person and one way only, but that too on the condition that we distribute their advertisements in Europe. Something had to be done, so I decided to go to Bombay and request the TATAs if they could help. There was a special secretary to J.R.D Tata, I forget his name now but he agreed to arrange another ticket. This was the year of tourism so there was no problem getting a visa to foreign countries. Neither was there a problem with one-way tickets at the time. We managed to get two one-way tickets but only till Rome, Italy. In Italy, we performed at the Italian Institute for the Middle and Far East (IsMEO). Through that performance we got invited to perform at the famous theatre, Teatro Goldoni and so we did. Then we went to Yugloslavia and performed in three cities and they were all wonderful performances. I remember as guests, we were even offered tickets, twice, to the well-known Opera La Boheme but unfortunately on both occasions we had such a time of partying and drinking the night before that we never made it to the opera. Back in Rome, we did another round of performances, each with a theatre-full of audiences. In the audience we also noticed a lot of red cardinal gowns. Soon, we were invited by the Assistant Father General of Jesuits, an Indian at the time, to perform at their headquarters near the Vatican. We were hosted at a lovely convent and the nuns were so extraordinarily impressed with us because we were vegetarian. They thought it was such an austerity and it was so spiritual, and made lovely vegetarian things for us. Later, the Indian Assistant Father general also organized for us an audience with the Pope Paul IV and so we also got to meet the Pope. One night, I heard that Joan Baez was going to perform at a theatre, and I was a particularly big fan of hers. It was disappointing to realise that I couldn’t because we too were performing the same night. Next morning when we went to see the papers, I was on the front page and Joan Baez was somewhere in small print. It was amazing and unbelievable. Nonetheless, we did get to met her later, but missed seeing her perform. And that’s how we began our theatre career. In the next few months we were invited by ITV (Italian TV) to record our performance. After the recording they said that they were cash strapped and couldn’t pay too much. We were used to that, because in India no one really paid or paid well at all – In Delhi we got Rs.250. But the Italian TV pay turned out to be a lot more than we had ever imagined. Excited about our big pay, we spotted a second-hand car sales place across the TV station and Gopal and I immediately bought ourselves a Black Volkswagen Beetle, with a Number 1 plate. We excitedly discussed how we could drive back home to India, because in those days you could’ve driven back home to India. In 1968, we drove to Munich, and the Southern German Radio & TV : Bayerischer Rundfunk, also recorded our performance. After the recording they enquired how much the Italians had paid us and simply upped our pay by a lot more. We were so happy and amused. I remember in Frankfurt, I also went and got myself my first pair of contact lenses. We met and made so many amazing friends along the way, some famous and some not. While we performed and drove all over Europe, our beloved second hand car would often break down. I remember a lot of our friends like actress Vanessa Redgrave and even the Qatari ambassador to India were among the many people pushing that car. In London we performed at various places, including the Mercury theatre, where T.S Elliot had performed his plays. Everywhere we went we received rave reviews. London is where we finally settled down for a while and continued to perform. Gopal began writing on the arts for The Times and The Sunday Times in London and wrote a book on Indian music, Filigree in Sound that was published in London. At the time the Royal Shakespeare Company (RSC) had an event called the World Theatre season. It was the most prestigious theatre festival and they approached us to bring a play to the event. Gopal said – “Yes, we’d like to, but the play I’d like to bring I haven’t written it yet.” He wanted to write a Ramayana relevant to our times, a modern, dramatic and humane interpretation of the Sanskrit epic. RSC happily agreed and signed a contract with us. When our event with RSC was announced, a TATA representative from London came forward to financially back the venture because we were getting India a good name. They awarded Gopal with a Homi Bhabha fellowship, the third person in the country to get it. At the end of our two-year adventure, in 1970, we returned to India and began preparations on the Ramayana. We also needed to find a space to rehearse the play. We began with the process of auditioning actors and actresses in Bombay for our new play. I remember Amjad Khan came, and others from FTII (Film & Television Institute of India) and soon we had a good crew. 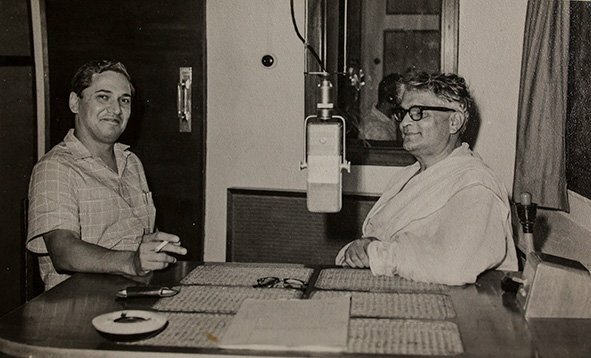 While in Bombay, I heard that Morarji Desai, deputy to the Prime Minister Indira Gandhi was also in-charge of allotting government housing to artists in Delhi, so I approached him about a place and he called me to his office at 7.30 in the morning. Gopal had written a preface on our Ramayana, and I showed it to him. Morarji Desai said he would read it and that I should return the next morning at exactly the same time. I thought he was a nasty man for calling me at 7.30 am in the morning. Nonetheless, I went and he had read it, had made some notes and said it was wonderful. I was shown six locations, and asked me to choose whichever house I’d like. I chose this one in Lutyen’s Delhi. Gopal hollowed out the bunglow, redesigned the space, and included a 50-seat indoor theatre. He did a lot of the work all by himself. Soon after rehearsals began, the cast went on strike over some grouses. Now when I look back it was probably an attempt by some envious people whose incitements sabotaged our crew. It was dreadful and we were upset, but we went to the bank, paid them their dues and said our byes. On a trip to Simla to pick up my daughter from her boarding school, Gopal who had clearly been doing a lot of thinking, asked me to perform all the 22 roles in the Ramayana he had written, by myself. He was inspired by the narrations of Kathas (the traditional Indian storytelling format) at his home in Lucknow, UP. I was not so sure, but Gopal rewrote the script into the form of a Katha and it began to look very good – and we began working on it. But there was more disappointing news. When RSE heard that our Ramayana was going to be a one-woman show, their interest in the project turned cold. They had envisioned an epic story with a large crew. That was a big blow. Nonetheless, we didn’t stop the work and I performed it for the first time in 1970, for a small audience above the porch of Ashok Hotel and later at other venues, including our own theatre. One day, a team from USA Educational Institute sent 15-20 people to see the Ramayana. It was their last night in India but they were quite impressed with the show and asked us to meet them for breakfast before they flew out. They said it was the first time they had seen something that displayed a contemporary spirit of India, moreover it was in English and hence understandable. They invited us to USA and to perform through their colleges. We went to America, and in the course of travelling, we were also asked to perform at the 1000-seater National theatre School of Canada in Ottawa. Along the way we met with a big New York based lawyer and an angel investor, Robert A. Hendrickson who was known to fund the arts, and was interested in our work. He came along with us to Canada to see how we did with a big audience. Of course, we did splendidly well, and soon he contacted us to do a season on Broadway and that’s how we got to New York Broadway. It was most fantastic. So far, we are the first and only Indian production to have performed on that platform. In 1981, TN Kaul, the Indian ambassador to USA, suggested that we perform the Ramayana at the NCPA (National Centre of Performing Arts), Bombay, but NCPA’s response to sponsoring the show was at best luke-warm. Kaul then invited actors Sunil & Nargis Dutt to watch us at Akshara. After the show, the Dutts insisted on paying for the play to be staged at NCPA. We agreed and played for 10 days straight to a full house. I remember after one of our shows, JRD Tata invited us for tea and said that he hadn’t watched the play, but it wasn’t because he did not want to. He had sent his driver to buy tickets but even the cheapest tickets were being sold in ‘black’ outside. Our Ramayana has since been staged more than 2,000 times over 45 years at the most prestigious of institutions around the world and everywhere we went the theatres were filled with audiences. We did a lot of more work after that. A play called Karma, which was funny and moderm. I produced, performed in and narrated most of Gopal’s acclaimed television films like India Alive, The Kashmir Story, The Sufi Way, Gitanjali and Gandhi’s Gita, a play about Mahatma Gandhi’s translation of the Bhagavad Gita into Gujarati and how he and his wife Kasturba went through the final revision in the Himalayan foothills. Gopal passed away in June of 2016, and his last appearance on stage was on April 13, 2016, when he played the part of the British Presiding Magistrate in the play about my father in the English Prison: Suresh Vaidya vs The British Government. I miss him a lot. But we both believed in our work, the wisdom of life, love and theatrical arts and that should never stop. These days I am writing a play on Gopal and my life. A life that we have so loved, enjoyed and shared. We built a wonderful world together. But this story is about Akshara Theatre, Gopal Sharman, me, our family, friends and well-wishers. We have been theatre performers for so many years and we have been extremely fortunate. Built in phases over a decade by Gopal himself and his team, the Akshara theatre, a non-profit arts institution, is spread over an acre of land and has grown to a 96-seat indoor theatre, and a 300-seat amphitheatre at the back of the property. Our life is about our work, and anyone who is a part of our family or the theater has to willy-nilly perform, including our dogs and cats. This image is of my wife’s relatives in Kenya as a reference to the narrative below. In the late 19th century, an enterprising and adventurous Parsi Indian Alibhai Mulla Jeevanjee left Karachi (now Pakistan) and sailed to Australia. As a house-to-house hawker, he managed to gain some knowledge of the English language and eventually migrated to East Africa in 1890. There, he established contact with British investors who were looking for some help to manage the planned Uganda Railways. After five years, Jeevanjee was awarded the contract to recruit Indian labourers from Punjab, to build the Uganda Railways in Kenya and the IBEAC (Imperial British East Africa Company) began building the railways construction from Kilindini Harbour, Mombasa. Beginning 1891, thousands of the Indian ‘coolies‘ (today this word is considered a racial slur in many African countries), mainly Sikhs & Punjabis, were recruited for a three-year-contract to build Kenya Uganda Railways. Almost all of them came alone, leaving their wives in India. One of the reasons why Indian labourers, instead of locals, were recruited was that the British faced severely hostility from the citizens of that country. The Indians on the other hand were there purely for economical reasons. They were also strong, tough and reliable hard workers and had previous experience with construction of building railways, roads, bridges and canals in India. In Kenya though, they had to face several hardships. Living in huddled groups in tents, they worked tirelessly to clear thick jungles, and break routes through hills and mountain stone with steel hammers and bare hands. Under harsh weathers, mosquitoes, snakebites, wild beast attacks, injuries and fevers were fervent. Hundred were dragged from their tents and eaten by Lions. Amongst them was my maternal grandfather Makhan Ram Vadvae, a technically savvy man who came from Lahore, (now Pakistan) leaving his wife in India. He was appointed foreman and would check the rail tracks while seated on trolley pushed by fellow workers. His name in the labor force records is signed in Urdu as “Man eater of Tsavo”. After the completion of railways in 1905, and the end of their contract – 51% of the workforce returned back to India, most in bad health, 8% of the work force died on job, 21% did not take their entitled return tickets and chose to stay in East Africa – setting up businesses along the railway lines, towns and cities. By year 1911, 12,000 Indians mainly Punjabis, Gujaratis, and Parsees (compared to 3,000 Europeans) were living in Kenya. A good number of them married local African women, others married mixed blood women and settled in East Africa giving birth to four generations of people with Indian-Kenyan origin. My maternal grandfather Makhan Ram too married a Kenyan woman, had children with her and settled in Kenya. He never went back to India. While things have changed for the better over time, the colour and gene based racism was rampant at the time and with the exception of Parsees, within most other Indians. The mixed blooded children of Indian men who married local African were frowned upon. Rejected and segregated by Indians themselves, they had a terrible time trying to fit into their father’s communities, schools, neighborhoods, work places, temples and Gurudwaras. Some were treated so badly by the father’s families that it forced them to convert to Islam and Christianity – communities where they were received well and given equal place in society. Ironically, visually, majority of mixed blood children were of fair colour and beautiful features – skin-deep characteristics that many Indians preferred over any other. My father Jagan Nath Nagpal too came to Kenya from Gujranwala, Punjab (now Partly Pakistan territory) around 1912 and began a tea stall at a railway station. Eventually he established a confectionery shop in the capital city, Nairobi. He married my mother, Maya Devi, Makhan Ram’s daughter. Two years after his marriage in 1914, he invited his elder brother from Punjab to Kenya, handed over the shop to him and decided to return to India. Around 1938, when I was around five years old and my sister Krishna was 10, my father decided to return to Kenya. I remember the four of us sailed to Kenya in an over crowded dhow (carrying 300+ people) from Porbander, Gujarat to Mombasa. It was a perilous journey of three months, during which many people died at sea, sick with typhoid, diarrhea and malnutrition. When we landed ashore in Mombasa, most people due to being crammed on the dhow and sitting in postulate positions for weeks & months had forgotten how to walk – people were falling down, whilst others were walking backwards. Almost all children and some adults had lice in their hair. Perhaps in India my father had gained more skills and in Kenya he became a skilled Halwai (sweets & dessert maker) who could make all kinds of delicious North Indian sweets. Later my parents had seven more children -Shakuntala, Baldev, Raji, Swarni, Subhash, Sukversha and Ashok. Years later, my father took a huge loan with a heavy interest to pay his eldest daughter’s marriage dowry, which he was unable to pay. To supplement some family income, as soon as I finished Form 2 (half way into Secondary School), in 1947, I had to start working at the age of 14 as a Crane Driver with East African Railways & Harbours, Mombasa. Four years later at the age of 18, I married a 14-year-old beautiful young mixed blood lady Rampyari Kohli. Born in Kenya, she was the daughter of an African mother and a Kashmiri father. After my father died in of a heart attack in 1951, I became the only support for the family. My wife and I had two boys and four girls. Then we adopted two more boys from my wife’s side of the family. All were born, bred and well educated in Kenya and overseas. Today most of them are living all over the world living in Australia, England, Germany and America. Some of them hold high positions as Bankers, Chartered Accountant, General Manager, University lecturers and directors. My daughter and I are still live in Kenya, a country I call my home. 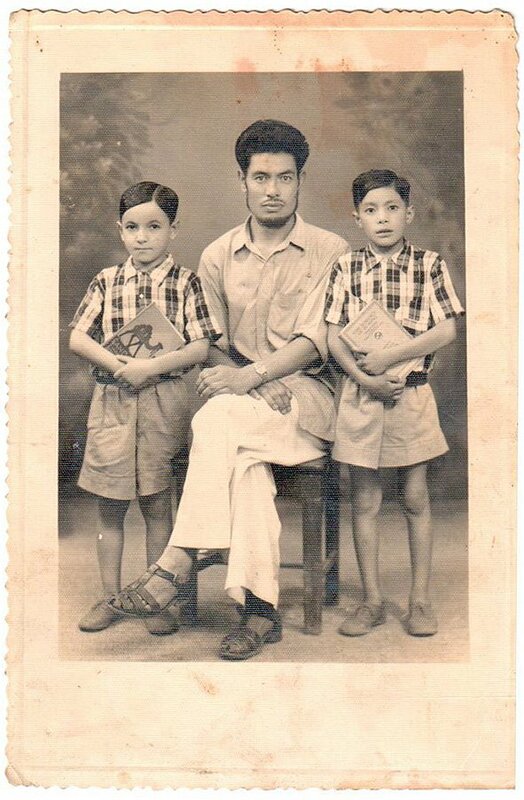 This photograph taken in 1943 or 44 is of my maternal grandfather, Dr. Suresh Chandra Mukherjee (extreme right) with his brothers. It was taken in a forest hideout at the Assam-Burma-East Bengal border. My grandfather, Dr. Suresh Chandra Mukherjee whom we fondly called Dadu, was born in 1895. Our family originally came from a small town in undivided Bengal and India called Khulna (now in Bangladesh) but they worked across the states of Bengal and Assam. Dadu’s hobbies included fishing and photography. He married my grandmother, Bimala Bala in 1909 when she was only 9 years old, he was 23 and already a doctor. Dadu was a renowned gynecologist & an obstetrician, and also specialized in tropical medicine. He worked with the George Williamson & Co., a Tea Company in Assam ( now Williamson Magor & Co.). In this photograph, my grandfather wears a British army uniform as he had been recruited into British Army to serve during World War II, when the Japanese occupied Burma and parts of the North-East Frontier. During the war, and due to fears of Japanese attacks and bombings, the entire family of six brothers, their wives and children moved to a relative’s place and hid in the forest. 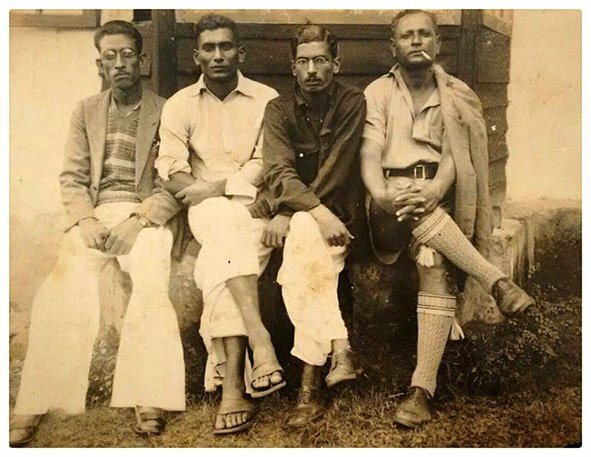 The second person on the left is his younger brother Dinesh Chandra Mukherjee who later worked in the Foreign Service. The other brothers’ names I don’t’ know but one was a school headmaster. Not in the photograph is the fifth brother, Dr. Debesh Chandra Mukherjee who was also a doctor and was one of the five physicians dispatched to China by Netaji Subas Chandra Bose to provide medical assistance during the Second Sino-Japanese War in 1938. Dr. Dwarkanath Kotnis was the other well-known Doctor in the group, on whom the film Dr. Kotnis ki Amar Kahani is based, and my granduncle is mentioned in it. My grandfather was the only one who served in war. Life during the war was difficult. Most importantly, food was rationed. No cattle or milkmen were available as lived in far away towns and villages. Each time my grandfather visited the family, he would bring milk and a prized tin of English biscuits – Jacob’s Biscuits. Sometimes, but not often, he would manage to bring in eggs and Anchor Butter (from New Zealand). Without refrigeration, and in the dense tropical forest, the milk would get spoilt. In army rations, milk was only available in army rations in form of powder, that the family would then hoard. Sugar was in very short supply and often not available- so they had to manage with Gur (Jaggery) to satisfy the Bengali sweet tooth. And the most difficult thing, especially for Bengalis- was that rice was rationed, and if it was available, it was very poor quality and hardly edible. So the family learnt to eat fish curry with chapatis (flat Indian bread). The family had to maintain a very low profile and keep their oil lamps, candles, and fires to a bare minimum in the forest, lest they attracted the enemy. My grandfather served on the Manipur-Burma border and they were successful in stemming the Japanese entry. He had a team of informants to keep the British army abreast of the activities of the Japanese. He helped and supervise the construction of roads and bridges in the region for the British army to travel to strategic places to quell the enemy. Eventually, in 1945 the Japanese were defeated and my grandfather was decorated and personally thanked by Field Marshal and Commander-in-Chief of India Sir Claude John Eyre Auchinleck otherwise known as “The Auk”, who also served as the British Army commander during World War II. The Auk also wrote my grandfather a personal note on his efforts, that still lies in our family archives. Dadu continued to serve the tea company after the end of Japanese occupation. Later he moved to Calcutta (now Kolkata) and established a private practice. He retired at the age of 75 and passed away of old age at 85, in 1980. This is one of my favourite photographs of my mother Indra’s family. It was taken in front of her family’s home in Sindhi Colony in Karachi, almost a decade before the partition of India and Pakistan took place. It is difficult to pinpoint an exact date but I estimate it was the 1930s. It is possible this photo was taken on the occasion of my uncle (mother’s brother) Moti’s wedding but I cannot confirm it. Sitting in the middle are my grandfather, Gaganmal Jhangiani whom we fondly called Baba and grandmother, Laxmi Bai whom we called Ammi. Around them sit his children, his brother’s children and a relative-in-law. Baba was a tall and dark complexioned man, and Ami was petite and fair. To me, they seemed like ebony and ivory. Ami and Baba used to play together as children and when Ami turned 12, the families got them married. It seems that my grandmother had basic elementary education but like most women of the time, she became busy with domestic matter and household duties. My grandfather was an architect by profession and had studied in England. I have been told that he was instrumental in designing and planning the Sindhi Colony in Karachi. Life was good for the family : they had a lovely home, a horse carriage, and a great love of music and culture. Each one of them knew how to play an Indian classical music instrument. The family would even sing together on many occasions. My mother, Indra always told us stories from her youth with utmost glee, reliving her days of fun and freedom. Here she stands directly behind Ammi on our right. My mother was independent natured, fierce and talented. She played the Harmonium, Sitar, Tanpura, and the Tabla. She also loved to sing and longed to perform on radio, which of course, was out of the question – For it was improper for a girl to do such things in society. Nonetheless, my mother found a way around and would sneak away from home in the horse carriage when no one was watching. My mother and her siblings were staunch supporters of Mahatma Gandhi and participated in the struggle for freedom and would often march along with pro-independence processions against British rule. Later, they even joined the Dandi march (Salt march) initiated by Mahatma Gandhi, and the women would carry red chili powder in their fists in case they needed to protect themselves. Upon an arrest of one such march, my uncles were put in jail, but my mother and other women were set free and that did not sit well with her. My mother said she felt cheated from the rush of spending a night in jail – fighting for a cause she believed in. 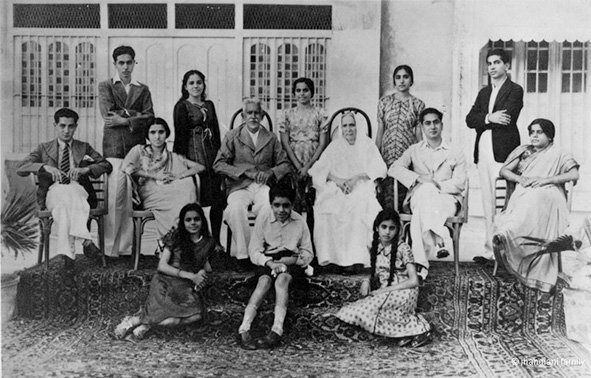 During partition, the family decided to leave Karachi and move to the Indian side of the border. They were amongst the few with an already established base in Bombay (a grand-uncle ran a sports equipment business). The family traveled light to Bombay (now Mumbai) in midst of rioting, with bare clothing to keep the children safe. Like million of others who could never return – Bombay became their home and they began a new life. 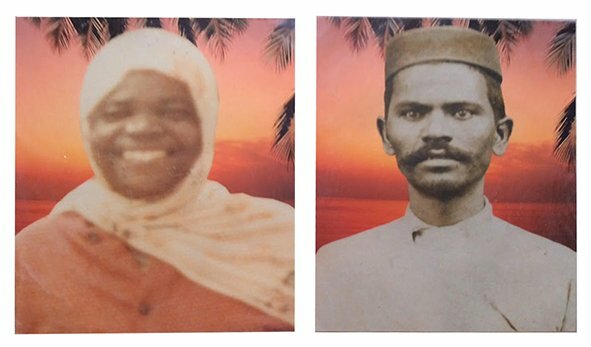 Many of our relatives were displaced or lost their family members during this migration, and for months after their move to Bombay, my grandmother would search the docks and train stations, for relatives and acquaintances who needed help. Baba passed away soon after the partition and I never got a chance to meet him, but I did inherit his reclining armchair, that he sat on every day to rest and read. 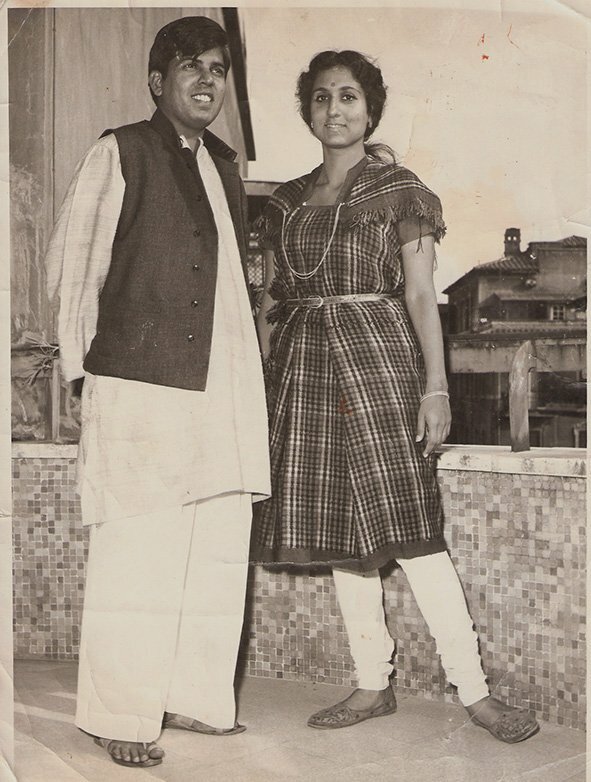 Years later, when my parents were on a flight to London from Calcutta (now Kolkata), they had an unscheduled stopover in Karachi due to technical difficulties. My parents used this opportunity to visit the places they grew up in. My mother was delighted and deeply saddened at the same time to see her childhood home and an engraved stone plate that still displayed the family name. A little bit of the past still lives on in the only surviving family member seen in this photograph, my mother’s first cousin, Radhika, sitting left in the front row. She celebrated her 90th birthday in August 2016. The man in the photograph above is my grandfather Faizullah Baba. Standing left is my grand father’s eldest son, my uncle, Abdullah, age 7, and on the right is Abdullah’s cousin Majid. During the Tibetan Uprising in 1959, fearing for his life, the Dalai Lama and his advisers fled Tibet with the help of the CIA and were given asylum by the Indian Government. While the world press published stories of strain in Indo-China relationships, very few threw light on the families that followed the Dalai Lama and fled from Tibet to India in the subsequent months. My grandfather and his family were few of the many that also fled to India to seek a better and peaceful life after the uprising. Our family, however, weren’t Buddhists but Muslim minorities living in Tibet and were often referred to as “Ka- chee” which literally means Kashmiri or Kashmir. One of the reasons that my grandfather also decided to flee was because he sensed Islam being suppressed by the Chinese Government and felt India to be more secular and comforting. Historically, our ancestors were from Kashmir. On one hand, they were traders who would travel between Kashmir and Lhasa to exchange goods, and on the other, they preached the teachings of Islam. Many community traders married local Tibetan women forming a fusion of cultures and resulting in the gradual growth of the Tibetan-Muslim community in Tibet. It was important for our ancestors that the young were educated in the lessons & practices it boasted and there were a few madrasas in Lhasa but these institutes were limited to religious education. My grandfather instead wanted his kids to gain more knowledge and decided early on (before the uprising) to send the young boys all the way to Delhi, in India, to study in a school founded within Jamia Millia Islamia. What fascinates me about this picture and the story, are the journeys young Abdullah and his cousin Majid, made each time they crossed over to the Indian border to study and to return during vacations. From Lhasa, they would hitch a ride with the traders, trekking through the rough terrains until the border, and then use public transport into India. Sometimes they would make a pit stop at Darjeeling, West Bengal and carry on till Delhi to attend school. They would embark on this journey back and forth each time they visited home in Lhasa. Occasionally, my grandfather, Faizullah, would make the same journey to go and pick them up from Delhi. This photograph was taken during one of those journeys. The well ironed collared shirts and half trousers with a book in hand were perhaps important props to display at the time because quality education in Tibet was rare and only a few attained an English education. The separations and the hard journeys must have taken a toll on both Abdullah & his parents but my dad says it was these characteristics of my grandfather that he greatly admired – His inner strength, his will power to let go of problems and his faith in the almighty. Maybe this is why my father, his siblings & cousins were encouraged to travel to far out places and pursue their dreams. By 1962, the Indian government granted the Kachee community permission to settle in India and many of my relatives began a new life in Delhi, Darjeeling, Kalimpong, Siliguri, Gangtok, Kashmir and Srinagar. My grandparents themselves earned a living by selling garments at one point. Abdullah, my uncle in the picture, took up teaching as a full-time profession in Kargil, Ladakh for most of his adult life. He passed away in Srinagar, Kashmir, at the age of 62. Today, 57 years later after this photograph was taken, I, a grandson of this community is writing this testimony in Delhi, the capital of India. My sister, our cousins and I are the third generation born and brought up in this country and a city that we now proudly call home. 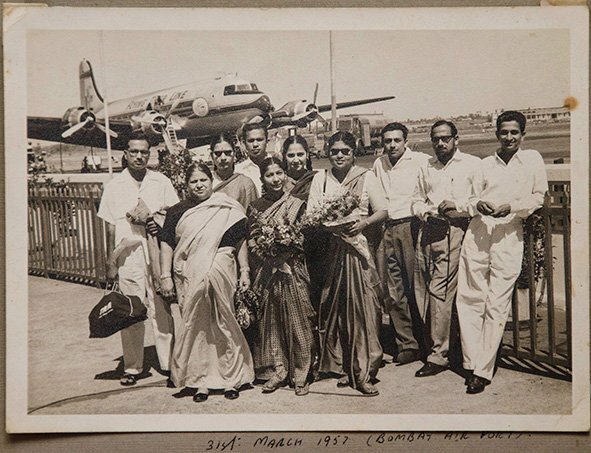 This photograph, as the handwriting below tells us was taken on the 31st of March, 1957 at Bombay Airport, Santacruz. Among the many photographs that adorn a very beautiful album maintained by my mother, Dr. Rehana Bashir, I find this picture the most fascinating, perhaps because of my love for airplanes and airports but also because it is the first picture of a photo album that is primarily a pretext to my mother’s life in England as a student. This picture is clearly my mother’s favourite too as it the opening image of that album. My mother Rehana was the only daughter born to Prof. Bashiruddin and his wife Shafiq Begum (standing left most in the picture) in 1930. Her father was a Professor at the Aligarh Muslim University and was a true modernist. He sent his daughter to St Mary’s Convent in Allahabad (UP), one of the best missionary schools in the state. She did well in studies and qualified to study Medicine at Lady Hardinge Medical College in Delhi. The year was 1949 and India had only recently achieved Independence, though the scars of partition were very visible. The best story that she has about going to study in Delhi is the scare that her father’s friends had tried to instill in his mind – of sending a young Muslim girl to study alone in a city where a number of people of the community had lost their lives in the partition riots. But my maternal grandfather was brave and did not succumb to pressure. His daughter found an admission into the Medical College. Needless to say that she was the only Muslim girl in her class. She recalls the time during the admission process – her father had stayed in old Delhi with his friends – and there was night curfew and an electric fence was drawn and turned on around the locality at night. Lady Hardinge Medical College exposed my mother to a cosmopolitan life and new friends. She remembers riding a bicycle around Connaught Circus, having ice cream at Wengers, (Delhi’s oldest bakery) and watching films at the Regal theatre (the first cinema theatre constructed in Delhi).) She completed her MBBS in 1953. The same album has a lovely photograph of hers in a black graduation gown holding her degree, posing at perhaps one of the famous Connaught Place photo studios. Her first job brought her back to Allahabad, where a hospital had been opened in the premises of Anand Bhawan, the residence of the Nehrus. It was called the Kamla Nehru Memorial Hospital. This was a prestigious first job, where Prime Minister of India, Jawahar Lal Nehru would drop by whenever he was in town to see how things were. After working for four years and acquiring much needed experience my mother, Rehana, decided to go to England for higher studies. England was still the most favoured destination for education and she already had a couple of her friends in London. On 31st of March 1957, Dr. Rehana Bashir took a flight, possibly the plane behind her (Flying Tiger Line), or maybe an Air India flight, from Bombay Airport to spend the next three years garnering a Diploma in Gynecology at a hospital in Brighton, England. A whole band of friends and family had come along dto see her off. In the photograph are my grandmother (left most), my two uncles and an aunt. My mother is in the center wearing dark glasses, holding a bouquet of flowers. Next to her is a close doctor friend Pushpmalti who had travelled from Allahabad just to say bye. The lady standing behind my grandmother in dark glasses is a friend from Medical College, Dr. Urmil Shah, their host in Bombay (now Mumbai); this picture is perhaps taken by Dr. Urmil’s husband, Gunvant Bhai and my mother recalls that the three gentlemen standing on the right are friends of Urmil and Gunvant. If we look closely, one of them holds the camera case. I have often discussed those years in England with my mother and what is fascinating in today’s context is that she says that for three years she did not hear her parent’s voice. Phone services to Aligarh from London were not possible then. It is indeed incredible that we are living in the grand leap of technology. 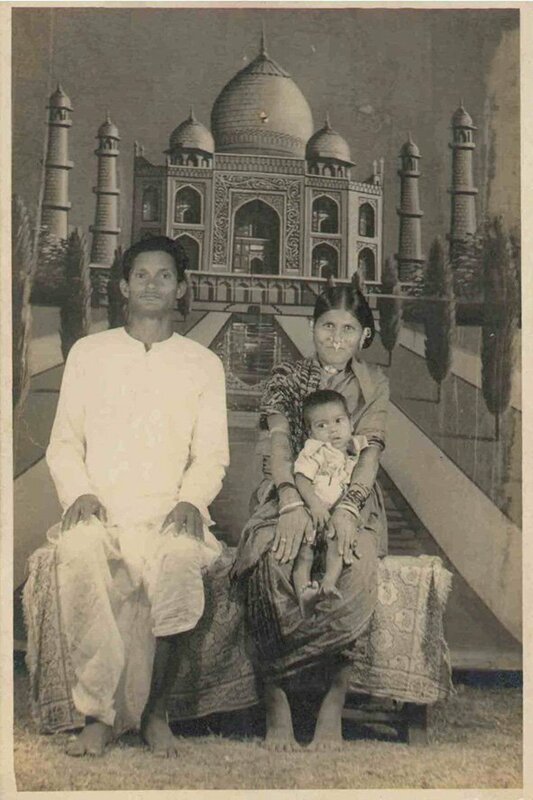 This picture was taken at the Meena Bazaar Photo studio in Kesinga (Orissa) and it has my grandparents Jagajiban and Kanak Sahu with their fourth son Shwetabahan. My grandfather Jagajiban was from Bagad Kesinga, Kalahandi district in Orissa (now Odisha) and was the eldest in the Sahu family followed by four younger sisters and a brother. Even as a 10th standard high school dropout he somehow managed to get a job as a government teacher and taught mathematics and science to primary school students. He got married at the age of 20 to my grandmother, Kanak. As a young boy, Jagajiban was interested in serving society and was a renowned name in his village Bagad for his contributions towards the development of his fellow villagers. In 1967, he happened to meet with an Ayurveda physician in the near-by forest. The physician was looking for a herb to prepare a medicine and after few minutes of interaction, Jagajiban discovered that he had written Rasayana Kalpadruma, an ayurvedic book that proposed the ultimate solution for youthfulness. Jagajiban returned home impressed and influenced by the science of Ayurveda. So much so that in 1968 he convinced his wife that he must leave with the physician to Berhempur to learn the art and science of Ayurveda practices. Over time he garnered an in-depth knowledge about Ayurveda and herbs that could cure some of the most dangerous and infectious diseases. In 1971, he returned to his village and began practicing in his village, offering ayurvedic treatments for free. He was famous for treating people with snake & scorpion bites and was believed to cure people just by chanting mantras. One of the foremost contributions to the country by Jagajiban was when India was in the midst of the Sino-Indian war in 1962. The papers were abound with news that the government of India had spent much of its money on war and was in deep crisis. Jagajiban decided to do something about it and marched across Kalahandi district to create awareness among the villagers. He asked for their help to save the country resulting in contributions in gold and money from farmers and villagers. He also donated much of his own personal wealth. When the government chose to honour his contributions, he denied it – saying that it was only his duty. The people of Bagad have now established a botanical garden named the Tengra Garden that is used for research in Ayurveda and is managed by Jagajiban’s son, my father. My grandfather Jagajiban Sahu passed away on February 4, 2016. Any Pictures, Letters or Text CANNOT be used for any reason whatsoever, without prior permission. Any unauthorised use will lead to prompt legal action. Indian Memory Project is free for reference (and ad-free) and takes us hundreds of hours to research and post narratives, as well as a lot of money to sustain. If you have learnt something new, appreciated or benefited in some way by this wonderful archive, please consider awarding us an honorarium of any amount you like. Click the coin.